I recently had the pleasure of spending time with Jean-Antoine Watteau‘s (1684-1721) Les Plaisirs du Bal, which was on view at the Frick Collection while on loan from the Dulwich Picture Gallery. 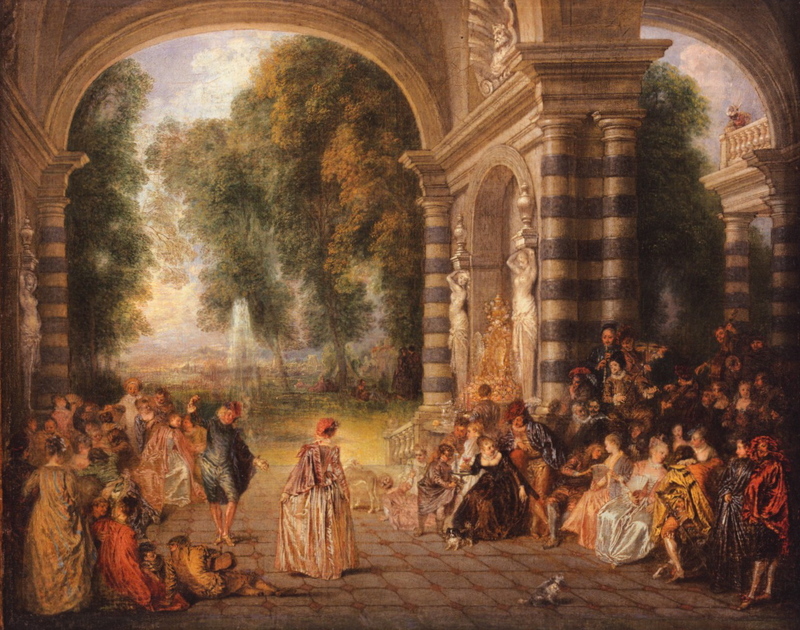 This is the most celebrated of Watteau’s series of poetic paintings which he called fêtes galantes. In Les Plaisirs de Bal, sumptuously-dressed revelers, many in costume or fancy dress, converse, dance and flirt in a lovely, imagined park. As a contrast to court painting, Watteau’s idyll has a relaxed, informal air—it portrays an earthly paradise. This intensely romantic painting about love, the various stages of courtship and the joys of intimacy, is so potent because Watteau evokes many moods at once—languorous sensuality, the lighthearted gaiety of youth, the pleasures of music and dance—all embellished with a touch of melancholy and irony. Watteau’s rich patrons liked to see themselves portrayed as benevolent figures in harmony with nature. The opulent setting, which depicts a Renaissance villa with caryatids and a fountain in a lush parkland, borrows much of its landscape ideas from paintings by Rubens and Veronese, and updates the genre to the 18th century. Watteau’s fêtes galantes, inspired by ballet and commedia dell’arte, are at the same time idyllically bucolic and extremely theatrical. Even though Watteau’s Les Plaisirs du Bal takes place in daylight, it brought to my mind this dreamy, evocative poem by poet Paul Verlaine, which was written in the 18th-century style, and inspired by Watteau’s fêtes galantes. Tristes sours leurs déguisements fantastiques. Seest thou the little winged fly, smaller than a grain of sand? It is indeed true that art is omnipresent in nature, and the true artist is he who can bring it out. Dürer’s beautiful and dignified watercolor of a beetle is an early embodiment of the Renaissance respect for nature—Dürer was among the first of his contemporaries to give an insect center stage in a work of art. In antiquity, insects had been included in trompe l’oeil and memento mori paintings to demonstrate technical virtuosity and as symbols of evil and death, while butterflies represented transformation and resurrection. 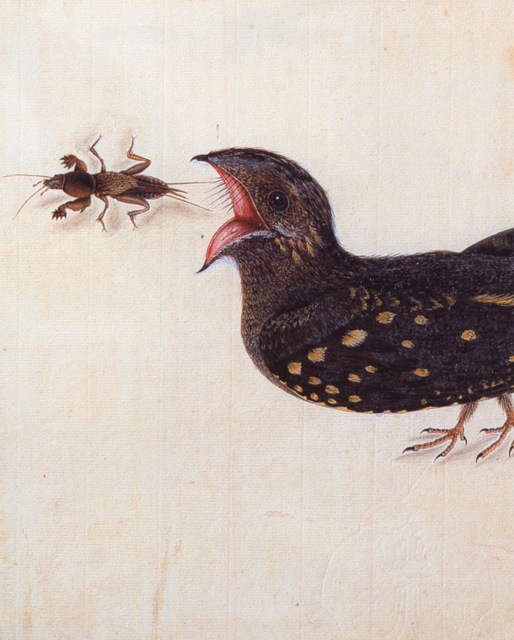 Insects in themselves were considered unworthy of consideration as subjects for painting. 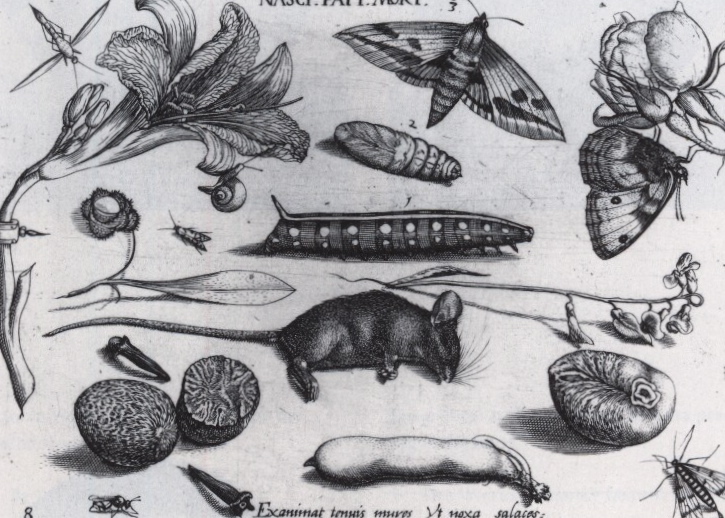 By the 17th century, the obsession with natural history—and with insects as a miraculous part of the natural world—took precedence, and symbolism was left behind. 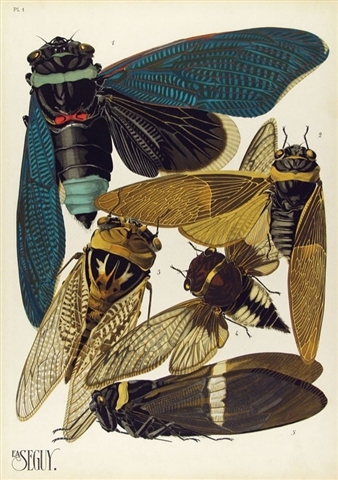 Insects became subjects of study and fascination. 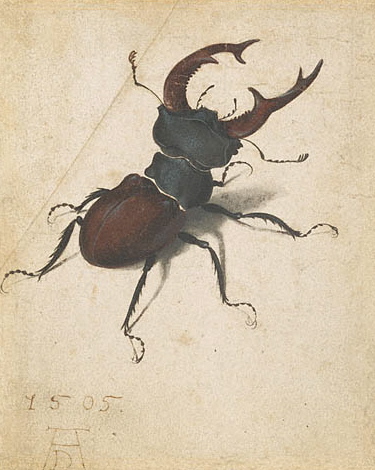 Dürer, as always, ahead of his time, brings his masterful draughtsmanship to his watercolor, of a beetle—which he considered a finished work of art, not a study. Francesco Stelluti‘s Melissographia, 1625, was the first scientific illustration done with the aid of a microscope and included three magnified views of a bee. Wenceslaus Hollar (1607-1677) was a Czech-born master printmaker, whose natural history illustrations have an elegant sense of pattern and design. 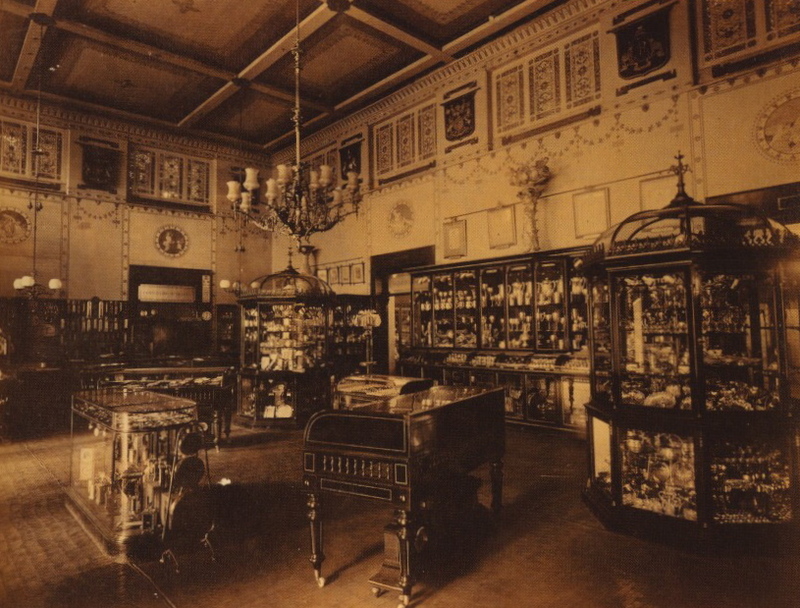 Cabinets of curiosity were the rage among collectors of the day, and assemblages such as this would part of the display. 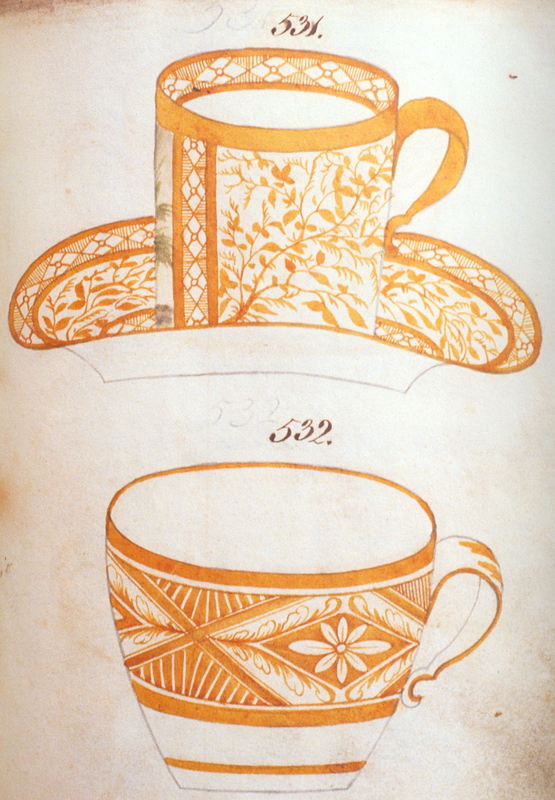 Hollar’s illustrations were likely influenced the engravings that Jacob Hoefnagel did from his father Georg Hoefnagel‘s original drawings. 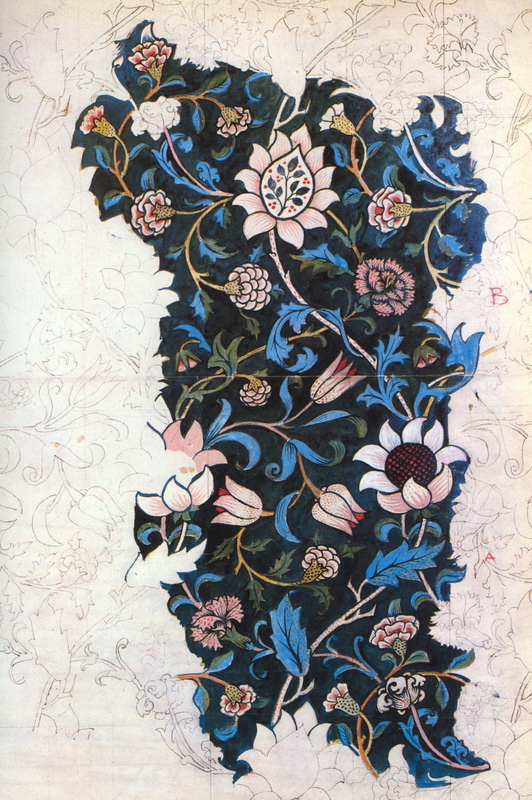 Alexander Marshal (c.1620-82) is famous for his beautifully drawn florilegium (flower-book) which he worked on for thirty years, until his death. 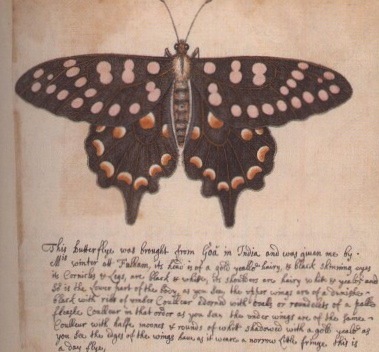 This lovely butterfly study, above, was painted from one in the collection of naturalist, gardener and plant-hunter John Tradescant the Younger (1608-62) when Marshal was a guest at his house in London in 1641. 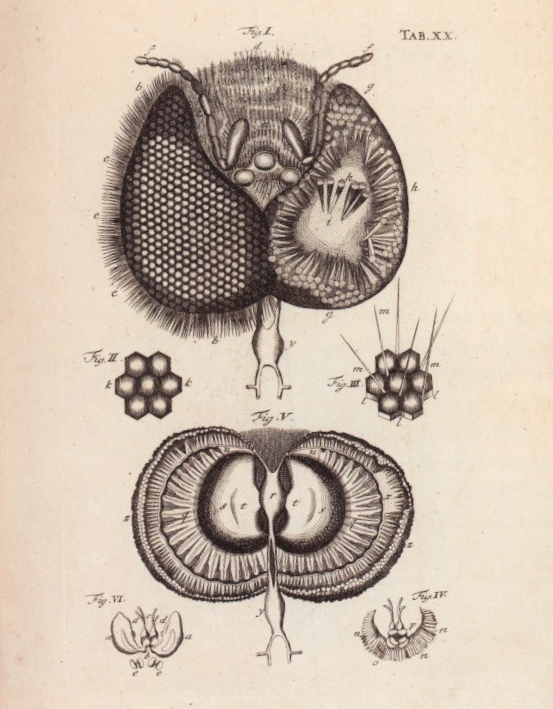 The work of Robert Hooke (1635-1703) is extraordinary in its detail and accuracy. 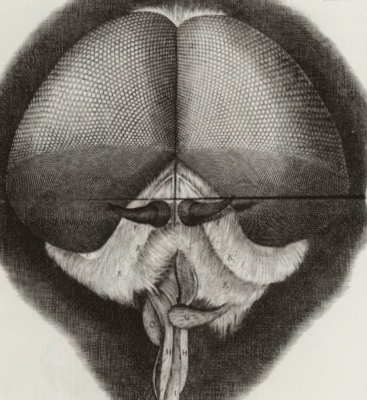 Hooke’s Micrographia is a landmark work in natural history illustration. 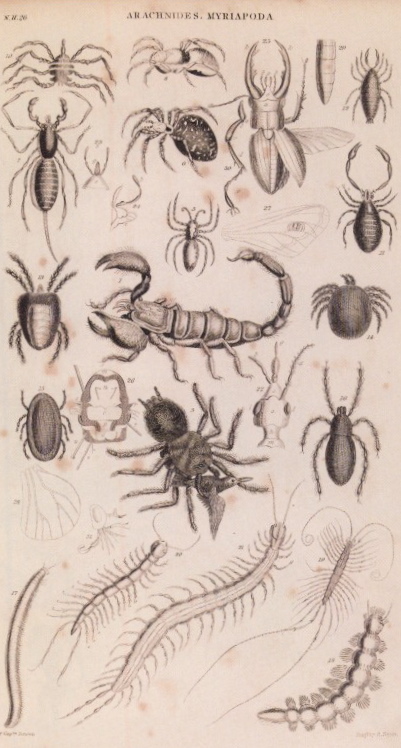 It contains thirty-eight copperplate engravings, his subjects all brilliantly translated from his keen observations under the microscope to an authentic, beautifully rendered two-dimensional image. 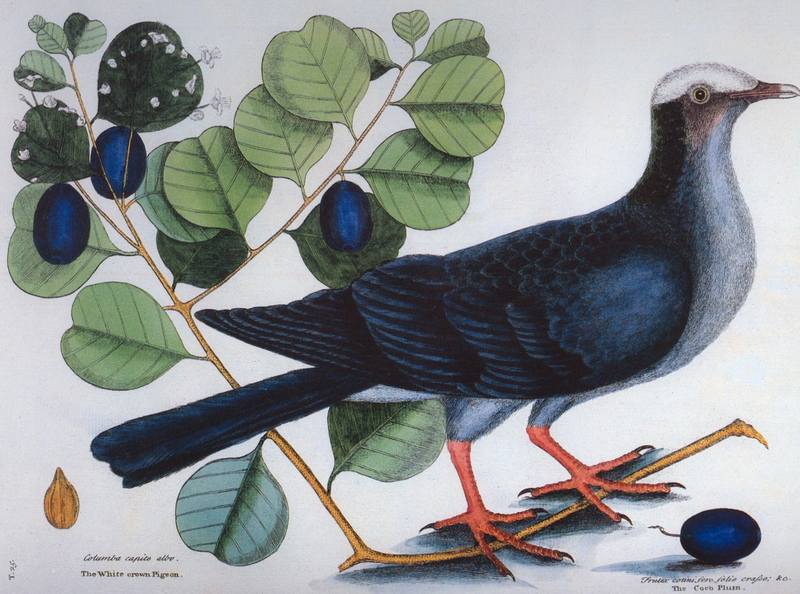 Mark Catesby‘s (1682-1749) life work was his The Natural History of Carolina, Florida and the Bahama Islands. His work really captures the life force of his subjects, and in this case, the predatory demands of survival. 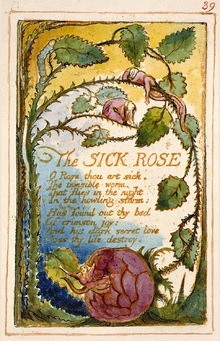 No artist captured the contradictory aspects of nature with more force and beauty than the great visionary Romantic poet, illustrator and printmaker, William Blake (1757-1827.) 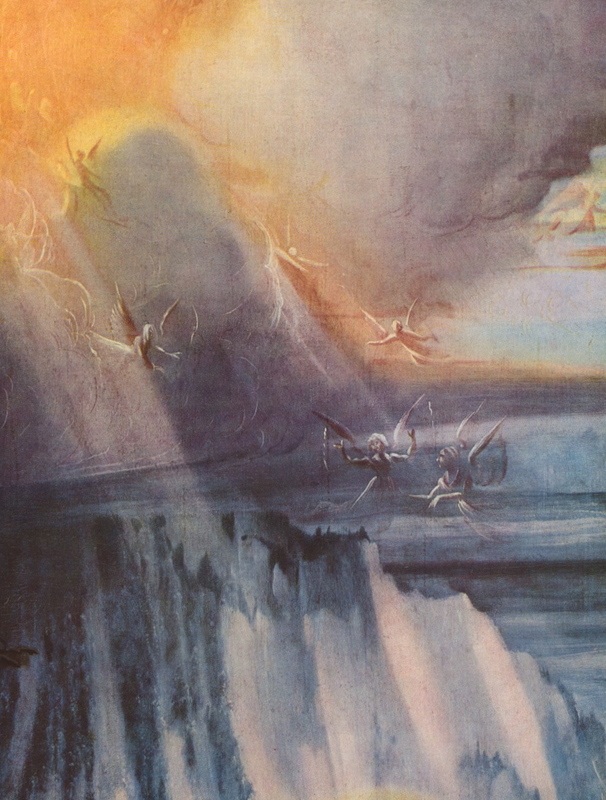 Blake, who described the human imagination as “the body of God,” and died singing and clapping his hands at the vision of heaven that awaited him—was nevertheless able to beautifully describe the dark, destructive aspect of nature. 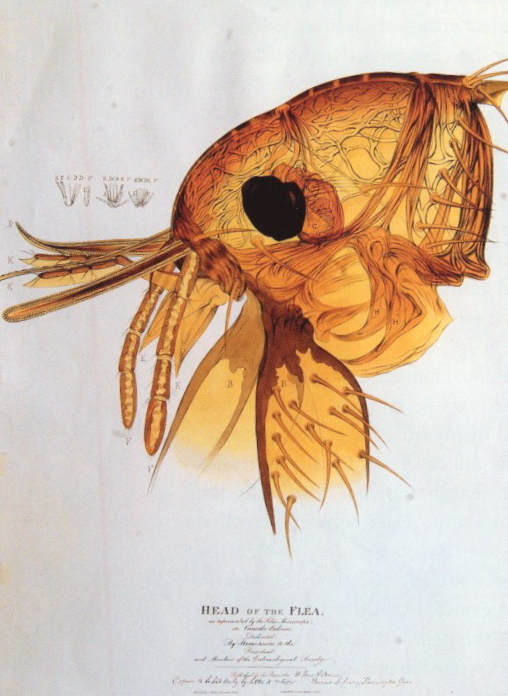 Two more impossibly detailed images of the heads of insects. 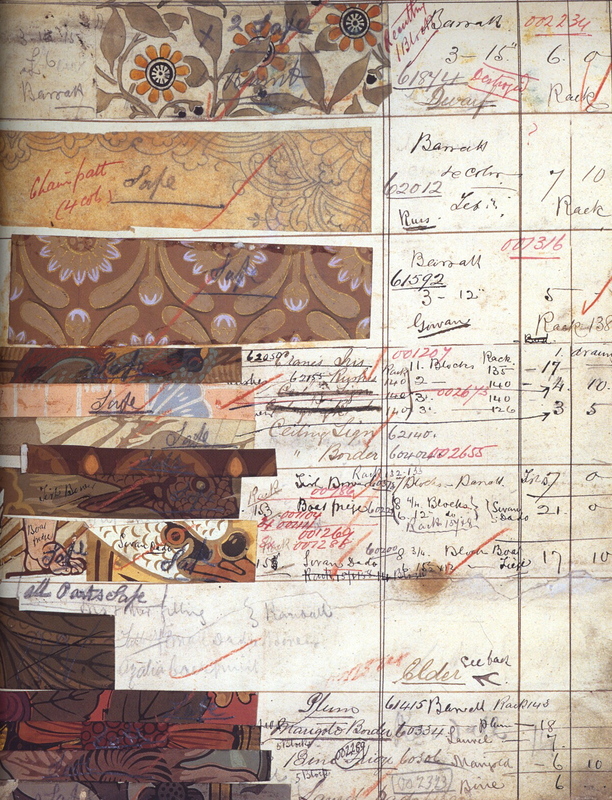 Above, Lens Aldous was a specialist in micrographic illustration. 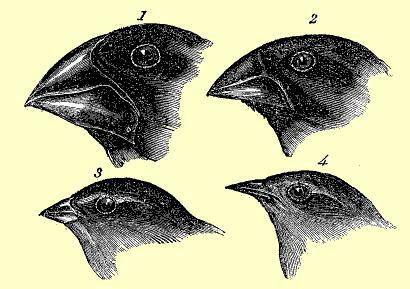 The year this image was made, Charles Darwin was Vice-President of the Entomolgical Society of London. 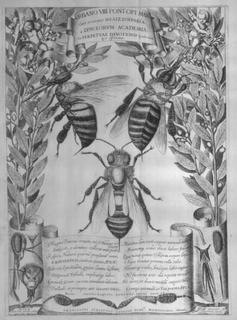 The drawing, above, of the head of a male bee, is in a book from Charles Darwin’s personal library. Microscopic studies were extremely important to the development of Darwin’s theories about evolution. 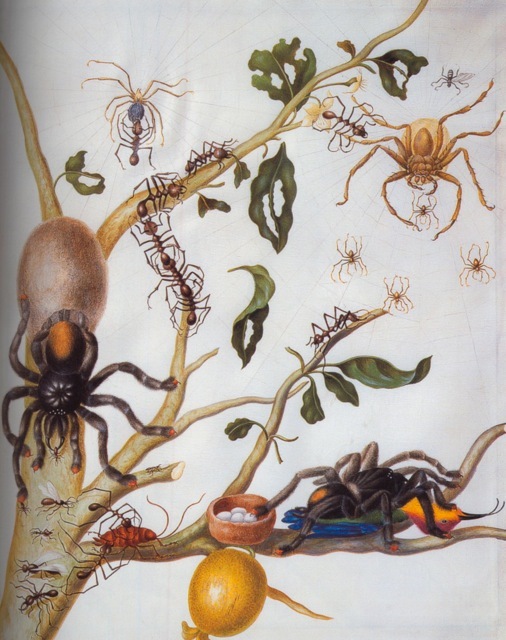 This illustration, above, is not just an inventory of types of spiders, it also shows the predatory nature of these creatures—note the bird in the grasp of the giant spider. 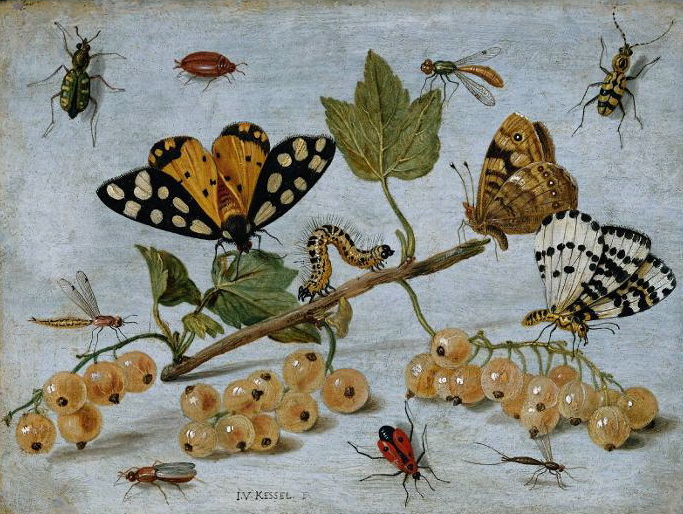 My favorite painter of insects is Jan van Kessel (1626-1679.) 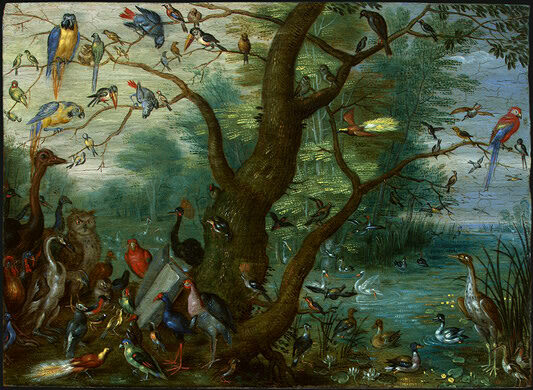 As with his bird tableaus, van Kessel created mini-universes teeming with life in his natural history scenes. 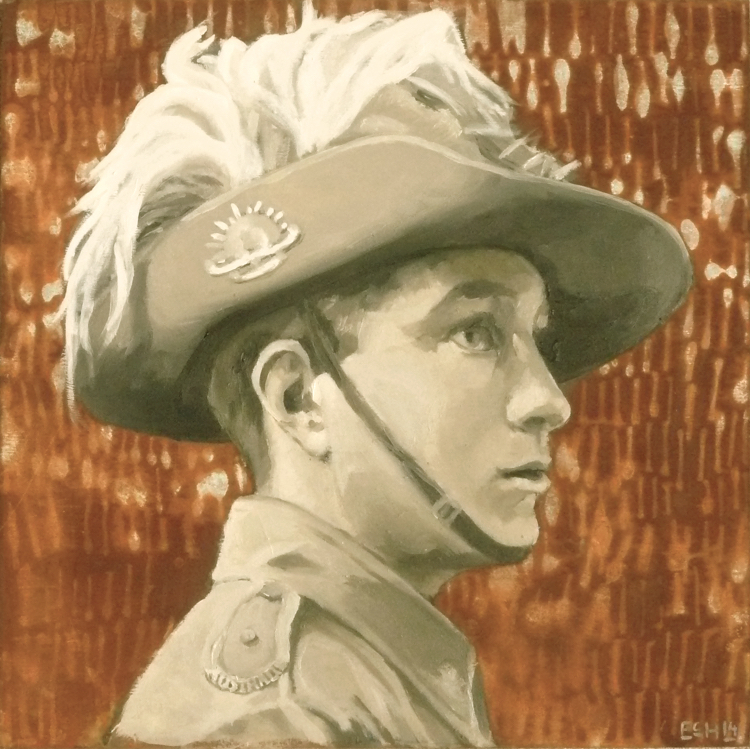 His works are mostly small oil paintings on copper or wood. Often studies like these were made into prints for natural history collectors. 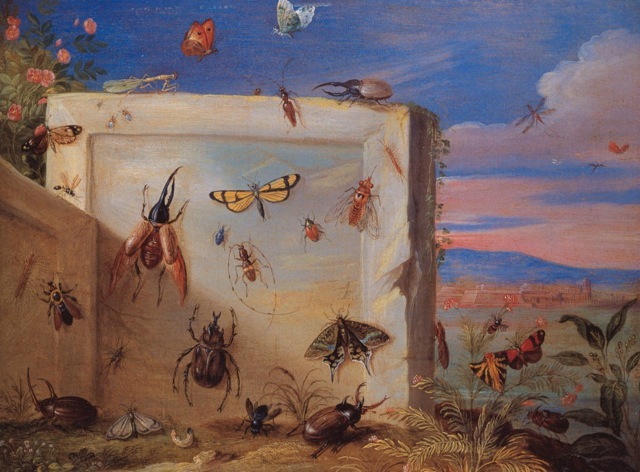 There are many 17th century still-lifes in which insects do not have center stage but instead play a supporting role. 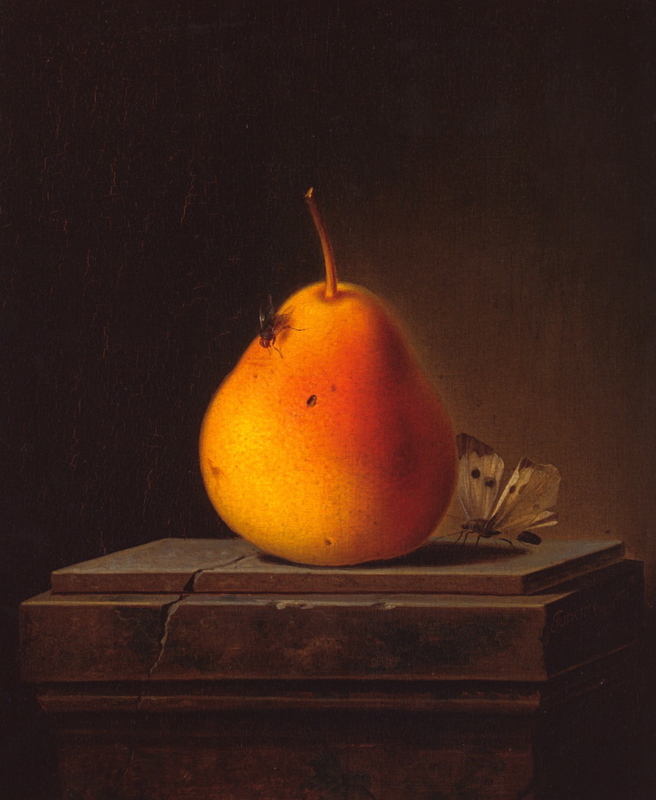 This beautiful painting by Justus Juncker (1703-1767) presents the pear as a sculptural form—the dramatic lighting and its isolation on the pedestal gives it a mysterious and monumental presence. Again, there are intimations of mortality—the plinth is chipped and cracked, and the small tears in the skin of the fruit has attracted insects. 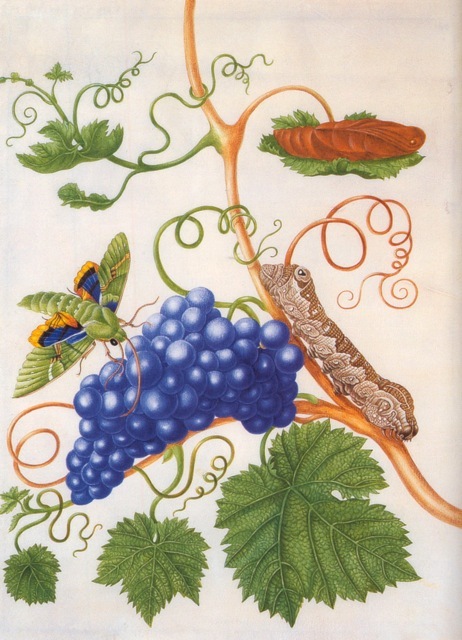 I can think of no more intriguing examples of botanical art than the work of artist and naturalist Maria Sibylla Merian (1647-1717.) 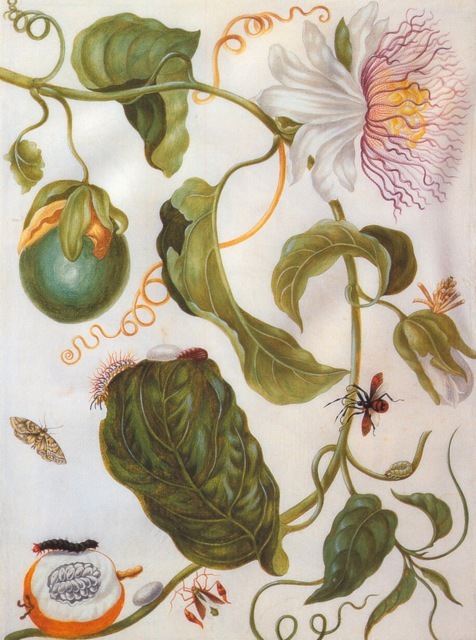 Merian began her entymological studies at thirteen, when she embarked on a study of flies, spiders and caterpillars. 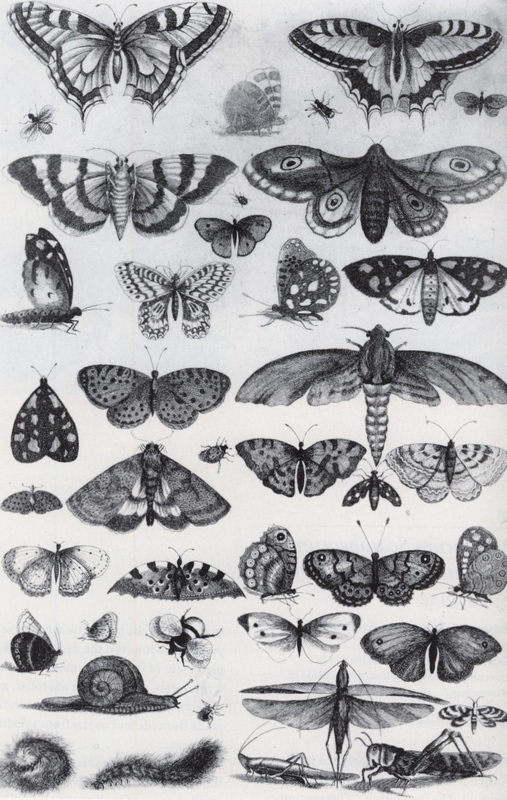 In 1705, Merian published her stunning Metamorphosis, a folio of 60 engraved plates of the life cycle of the butterflies and insects of Surinam, where she’d been on expedition from 1699-1701. I love the way Merian plays with scale, conflates species and creates drama with her lively and energetic compositions. 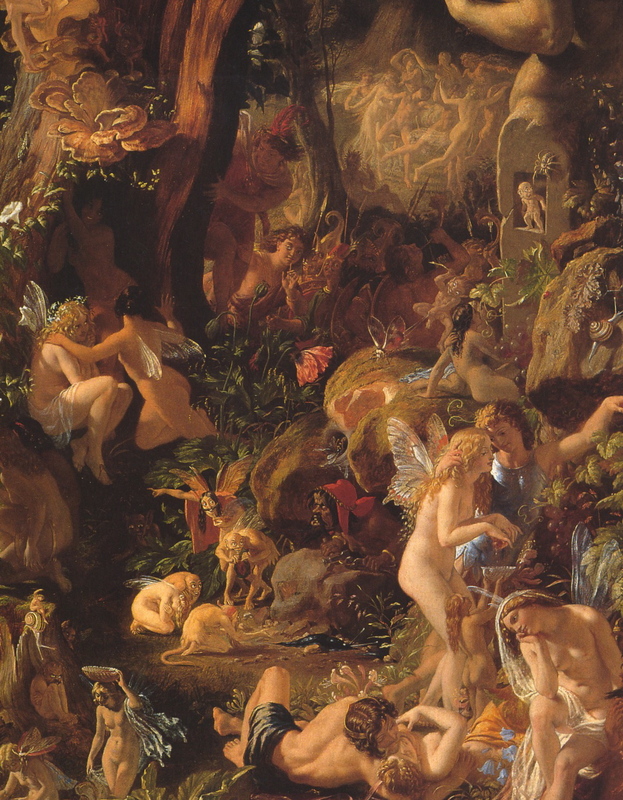 Insects also fired the imagination of Victorian fairy painters. 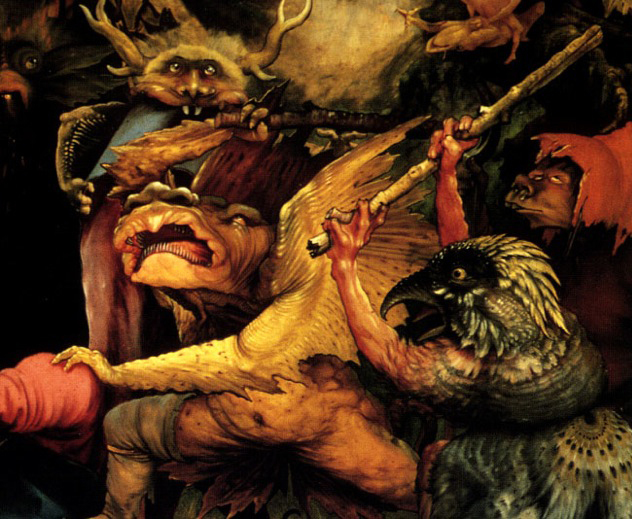 Their work was full of creatures that were half-human/half-insect—and elves and fairies ride around on the backs of butterflies and birds. 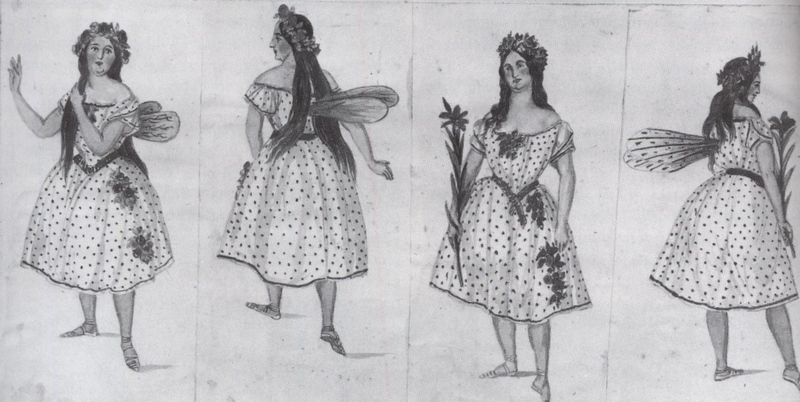 This costume sketch, below, is from Charles Kean‘s production of a Midsummer Night’s Dream which was produced at Princess’s Theatre, London, in 1856. 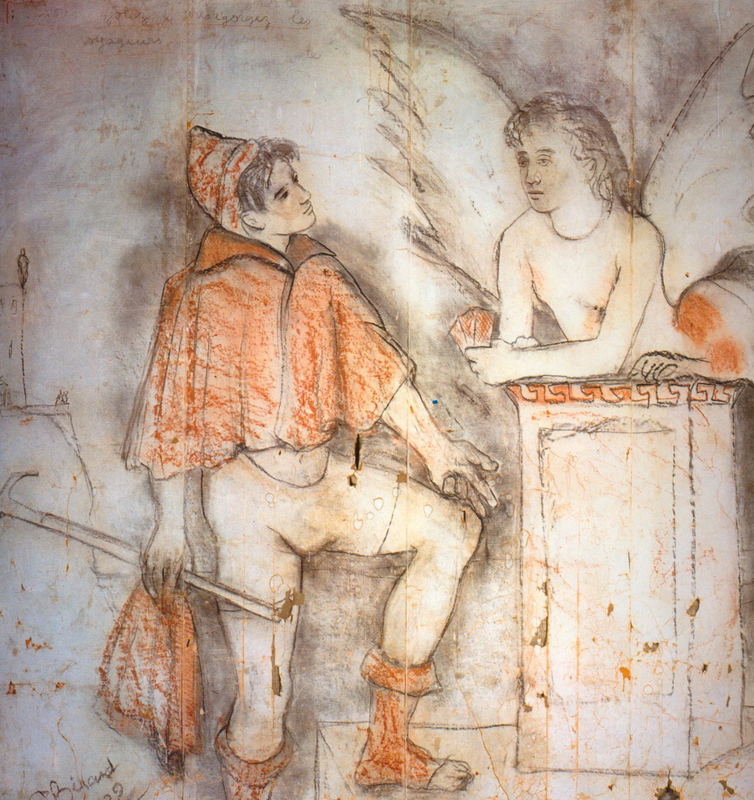 Shakespeare’s play was an abiding theme in paintings of this genre. 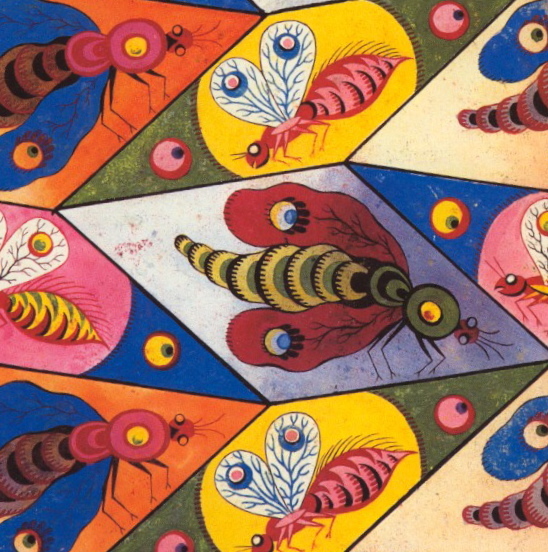 In the area of design, textile designers have also made good use of insect imagery, for example, this charming and colorful insect design from France, c. 1810. 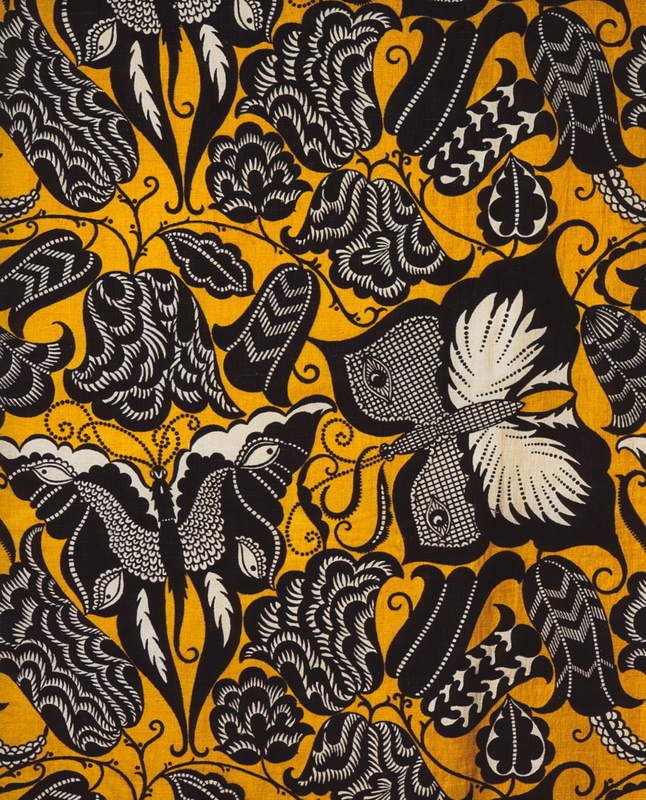 And, below, Dagobert Peche‘s vibrant Swallowtail design done for the Weiner Werkstätte c. 1913. 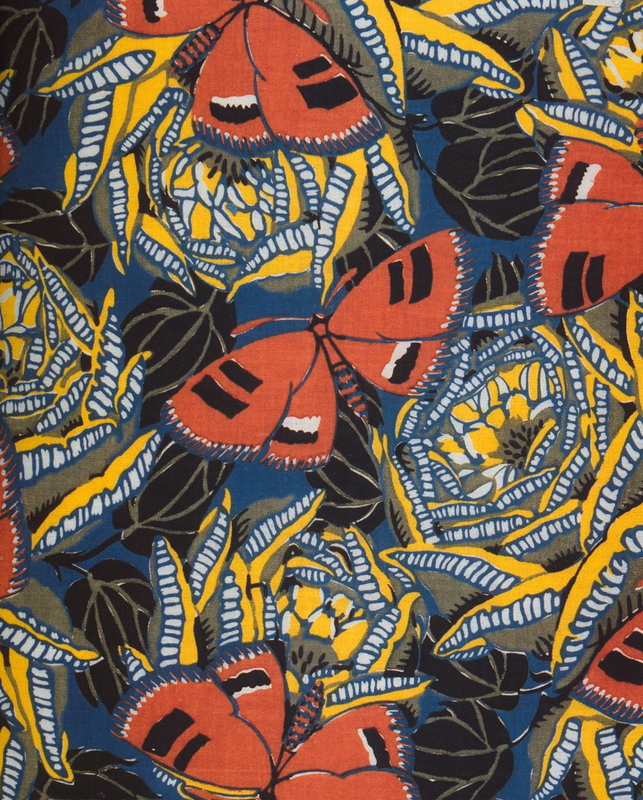 In 1926, master of French Art Deco design, Emile-Alain Seguy painted this beautiful pattern of butterflies and roses. 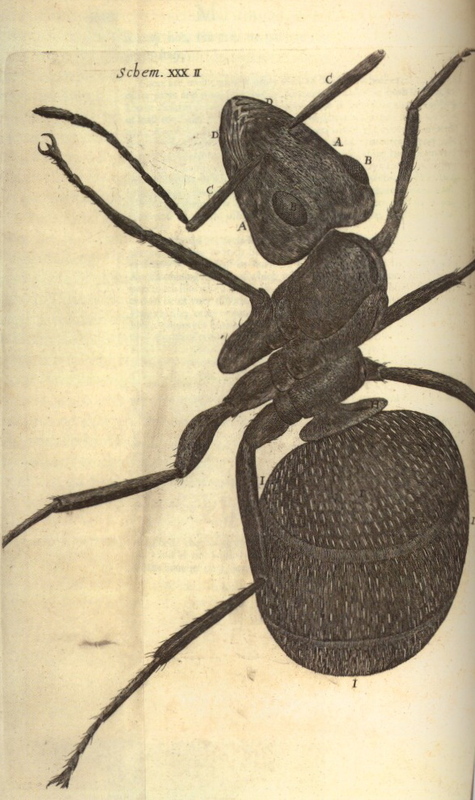 Seguy was perhaps most famous for his amazing series, Insectes, done in collotype with pouchoir. Contemporary artist Jennifer Angus creates large-scale installations made from petrified insects that are reminiscent of Victorian cabinets of curiosities. Angus’ work, with its kaleidescopic imagery, is an amalgam of science and art. It is highly decorative but is also meant to educate the viewer about the important role of insects in our environment. 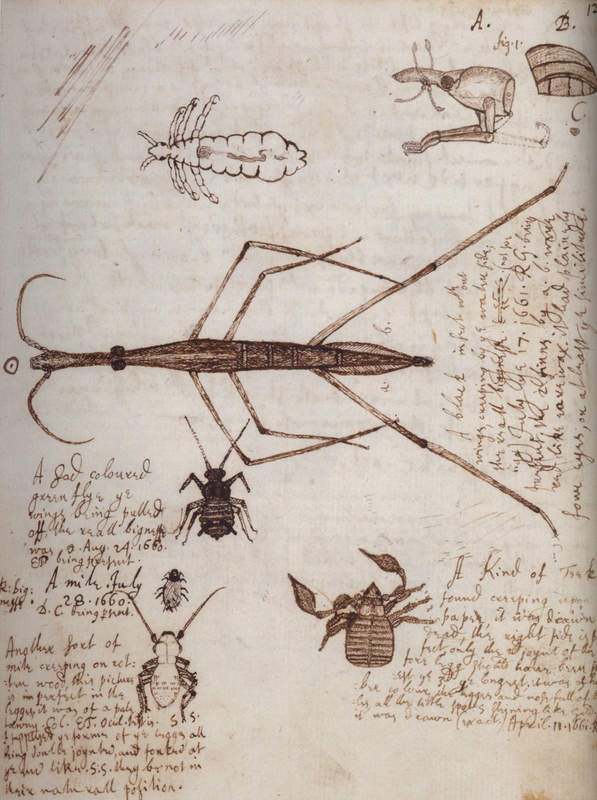 Before humans drew plants, landscapes or images of themselves—they drew animals and insects. The fascination with the natural world and the creatures that share our planet is ancient and enduring. I am grateful to the artists whose sustained intense observation and attention to detail have brought these creatures to life on the page. In his mysterious and enigmatic allegorical triptych, The Garden of Earthly Delights, Netherlandish master Hieronymus Bosch (c. 1450-1516) painted enormous fruits and giant birds cavorting with tiny people of all races in a sumptuous garden. This painting presents a complex labyrinth of seemingly contradictory ideas and motifs. 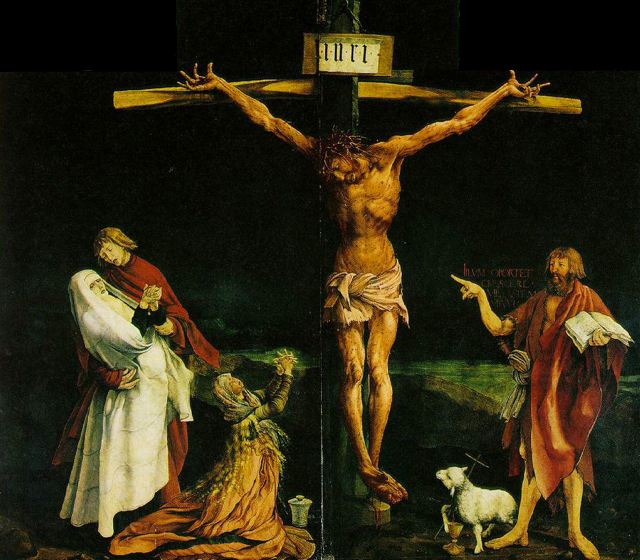 The triptych has been interpreted as a critique of the Catholic Church, a panorama of the Creation or a reflection on the humanist writings of Thomas More. 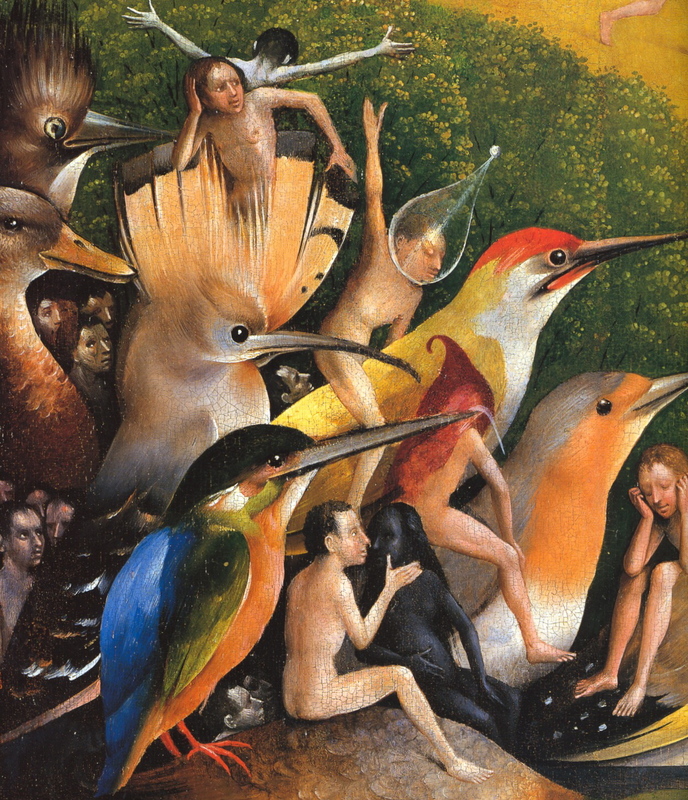 Whatever his intent, Bosch’s giant birds are wonderful examples of the way that painters throughout history have used birds—as symbols of nature and the soul, as go-betweens, harbingers and messengers—and as intriguing examples of the wonders of nature. 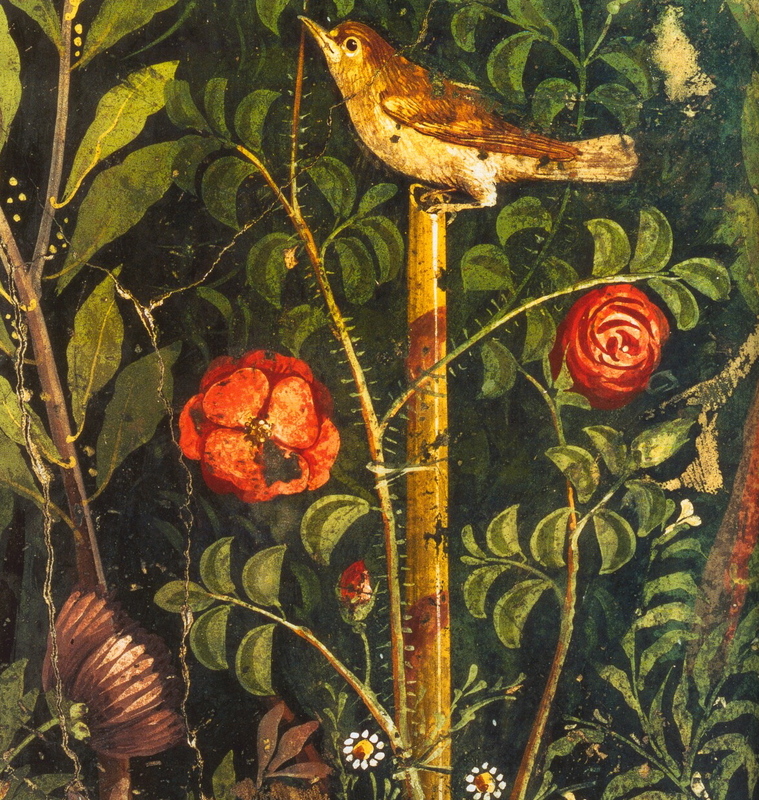 Roman garden painting, detail, first century A.D.
Gardens were often depicted in tomb and wall paintings in the ancient world. There is evidence that many types of gardens flourished—domestic gardens for both relaxation and as sources of food, gardens with sacred and religious meaning, cemetery gardens, opulent orchards and parks. Where there are gardens, there are birds. German painter Hans Holbein the Younger (1497/8-1543) was a very versatile artist who did portraits, religious paintings, frescoes and woodcuts, as well as designing jewelry and metalwork. Holbein first traveled to England in 1528 with an introduction to Thomas More from the Renaissance Humanist scholar Erasmus, whose portrait Holbein had painted in 1523. Holbein moved to England permanently in 1532, as court painter to Henry VIII, and there he perfected his art as a portraitist. 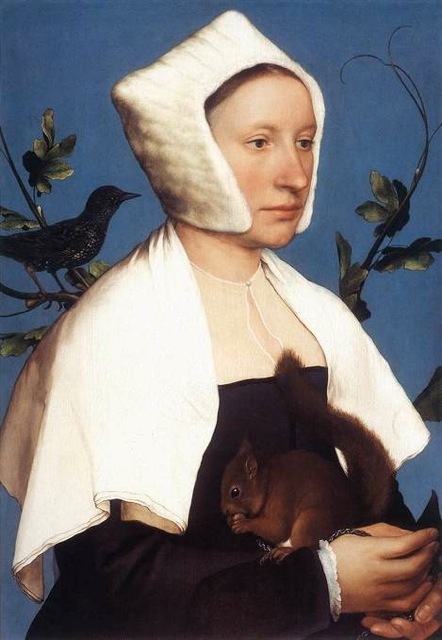 This wonderfully detailed painting is a study in contrasts, the serious pose of the sitter playing against the lively squirrel and starling (which may have represented the lady’s family coat of arms.) A luminous and rich blue background sets this enigmatic and fascinating portrait off like a jewel. 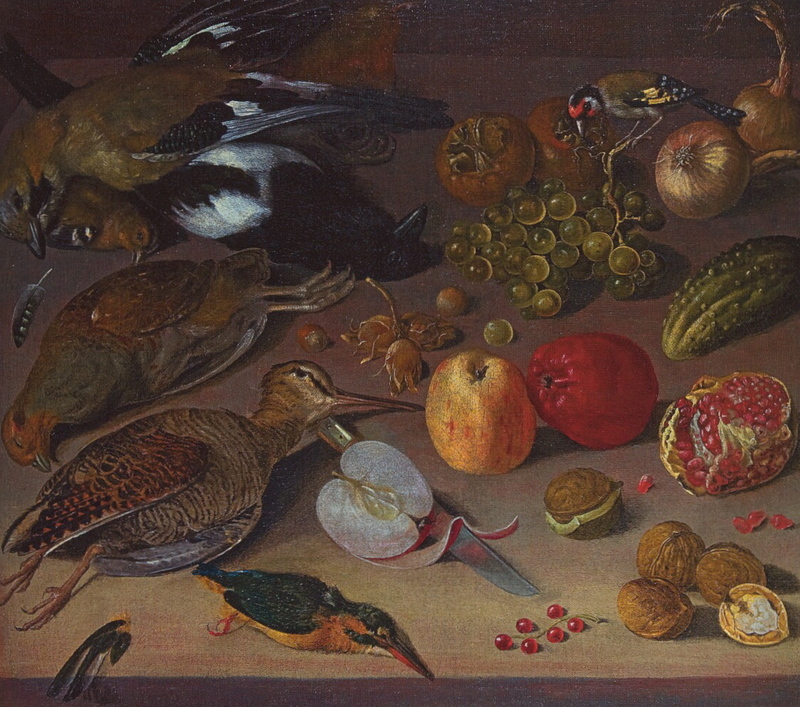 Georg Flegel, Fruit and Dead Birds, n.d.
German still-life painter George Flegel (1566-1638) specialized in paintings of tables set for meals with food, wine and flowers. I find this particular painting of Flegel’s very unusual and idiosyncratic. The elements of the composition are very deliberately laid out on the table and amidst the dead birds, feathers and fruits—all rather scientifically painted in a presentational manner—is perched a little goldfinch, very much alive. 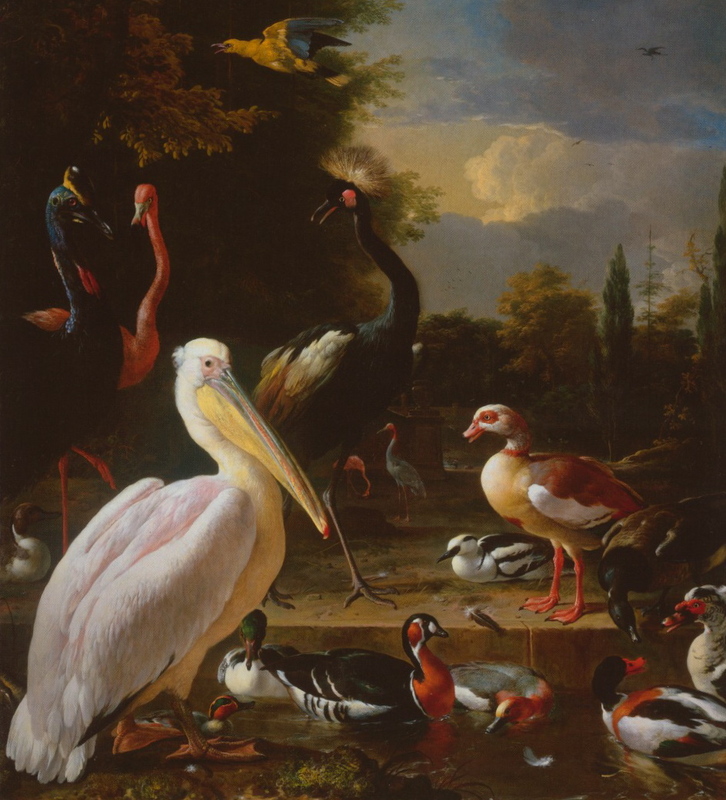 Melchior d’Hondecoeter (1636-1695) was a Dutch Baroque painter who specialized in painting animals, particularly birds. 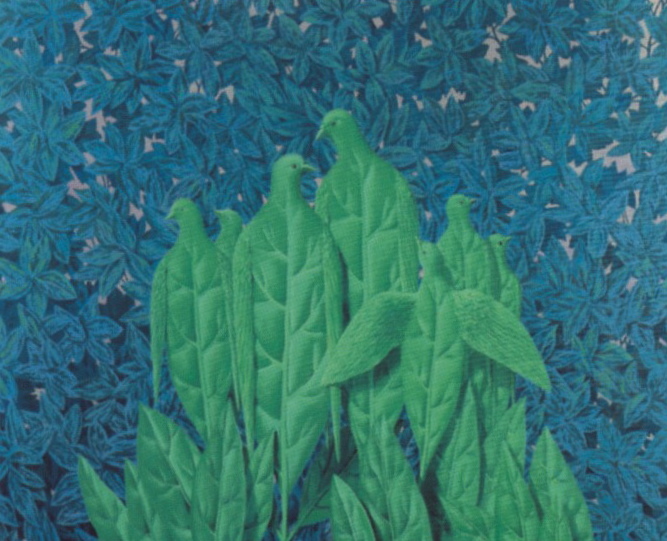 What is interesting to me about d’Hondecoeter is that he didn’t paint birds merely as trophies of the hunt or table, but as creatures with moods as well as relationships, feelings and inner lives. 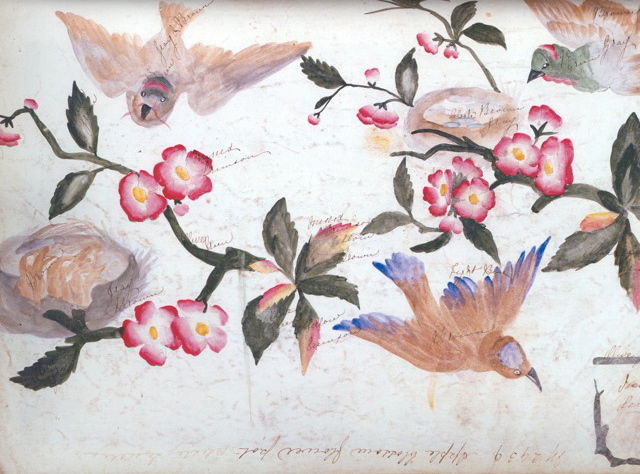 Flemish painter Jan Van Kessel (1626-1679), the grandson of the great floral painter Jan Breughel the Elder, did beautifully detailed intimate paintings on copper. He was an avid student of the scientific naturalism of his day and excelled at painting insects. 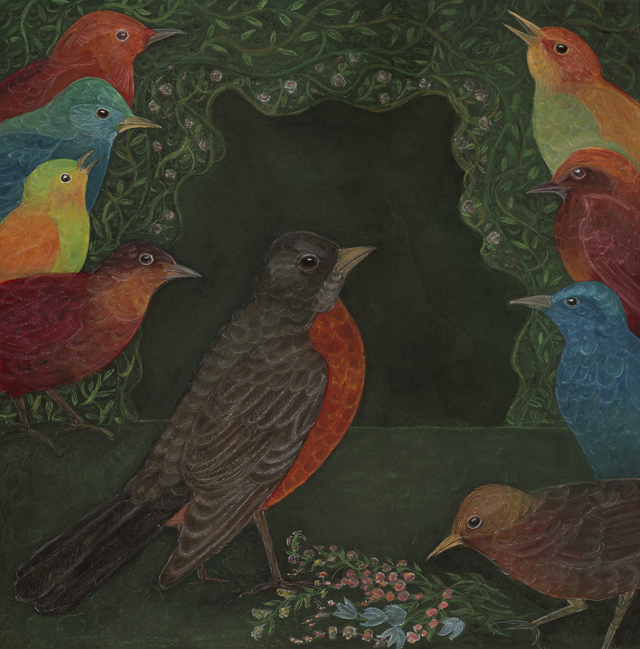 I am particularly interested in his panoramic scenes of birds—with their attention to detail and rich coloration, they have a cabinet of curiosities ambiance. Van Kessel also did some very beautiful still lifes, like this one, which includes a lively little bird that is depicted with wonderful movement and energy. This delightful painting by Dutch painter Carel Fabritius (1622-1654) is very much a portrait—you feel he has captured the essence of a particular bird. Fabritius, a student of Rembrandt, was very interested in exploring spatial effects and trompe l’oeil. This little goldfinch looks like he could fly off his perch at any moment—if he was not held captive by the little chain attached to his leg. 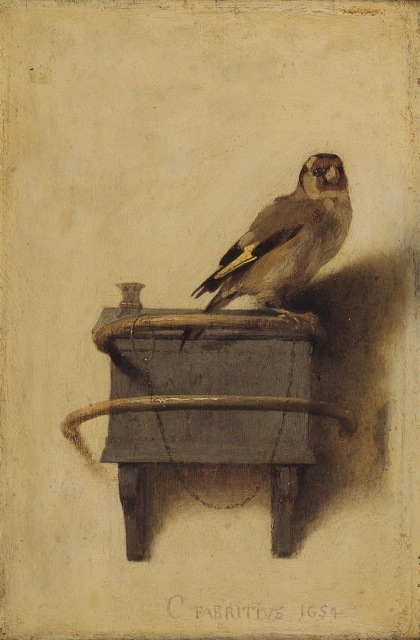 Fabritius very much created his own style. Eschewing the dark backgrounds and dramatically lit subjects popular at the time, he applied paint thickly, using a light-colored textured background and subtle lighting on his subjects. 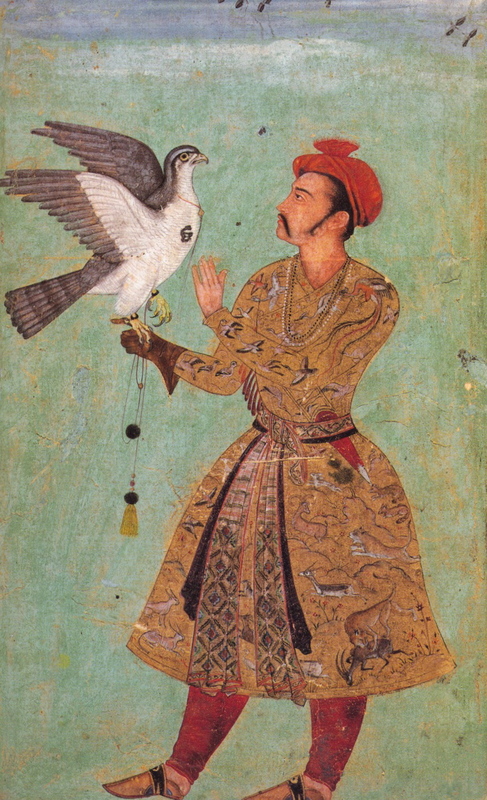 Royal figures with their falcons are a fairly common theme in Indian miniatures. In this beautifully naturalistic portrait, the bird is imbued with a definite personality and temperament. Only a member of a royal family would have worn such a magnificent robe. 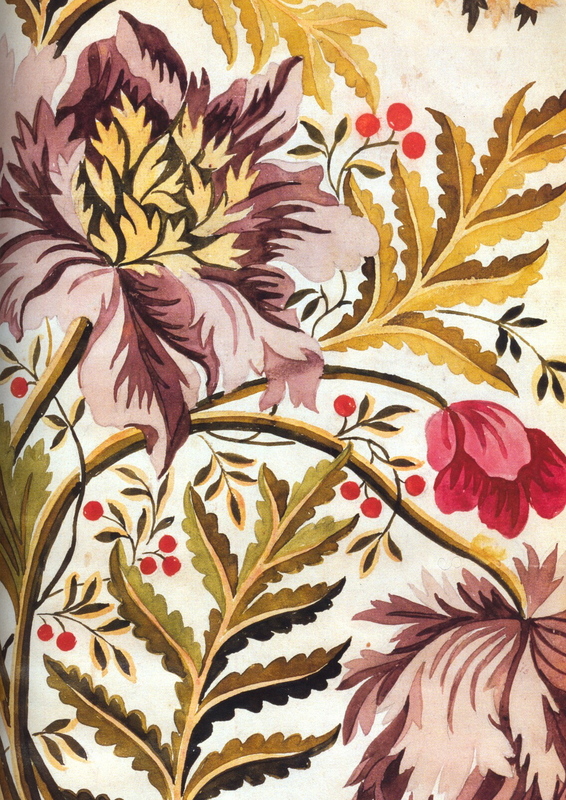 The silk brocade, which depicts animals, birds and plants in a lush landscape, was probably woven in Iran. Mark Catesby (1682-1749) was an English naturalist who spent 10 years in the American colonies observing the natural history of the New World and collecting specimens. 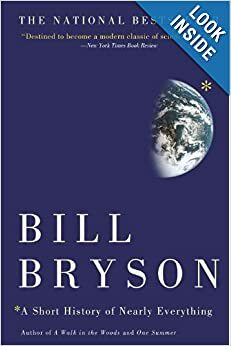 The Natural History of Carolina, Florida and the Bahama Islands, which he wrote and illustrated, is a magnificent achievement. Catesby’s etchings were innovative—whenever possible, he drew from life, and he often portrays his subjects in flight or in motion, with bits of plants and landscape that suggest their native habitat. His fascination and love of the natural world is evident in each illustration, especially the ones from the original edition, which he personally hand-colored. 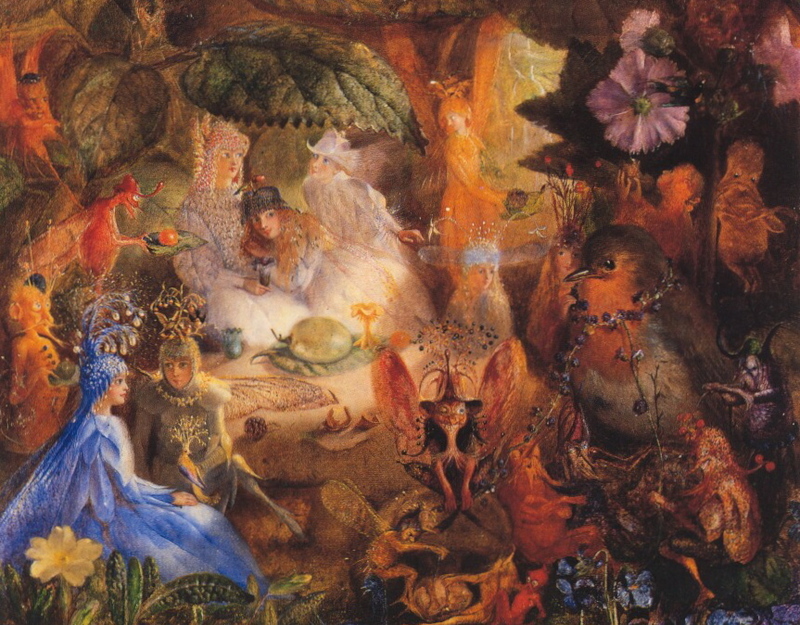 At first glance, the work of Victorian fairy painter John Anster Fitzgerald (1819-1906) is very deceptive—the intense, saturated colors and the beauty of the images initially distract from the often macabre, nightmarish or sadistic subtexts. There’s plenty of evidence that Fitzgerald’s imagery owed more than a little to opium and laudanum use, not an uncommon vice in Victorian England. Robins have a complicated role in fairy-lore which is often ambiguous—they are variously allies and enemies. 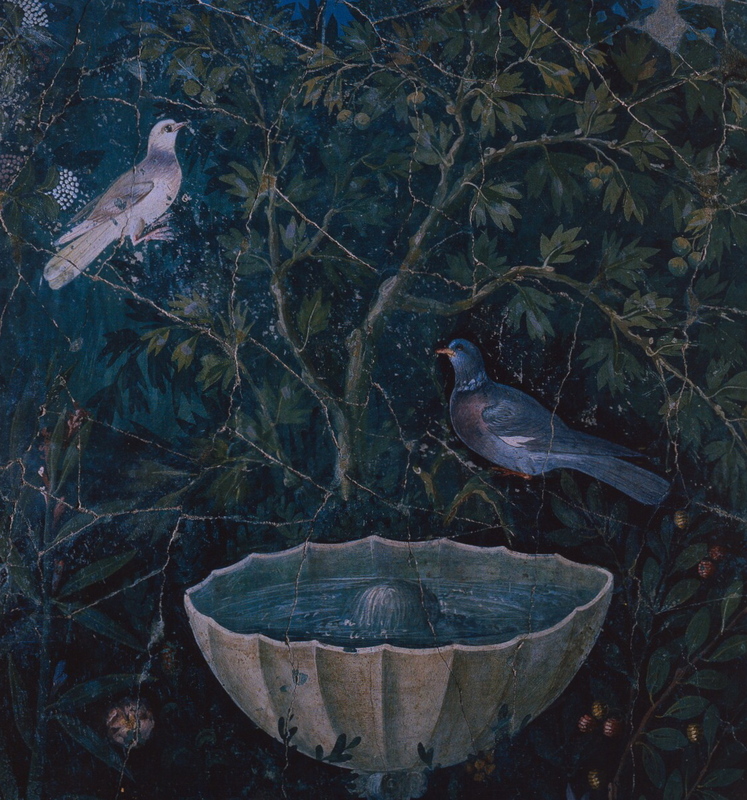 Fitzgerald painted a number of paintings about robins. As was often the case with fairy paintings, The Captive Robin is mounted in a large hand-made gilded twig frame that is quite extraordinary. Swiss artist Paul Klee (1879-1940) brings us into the modern era, which reveals a new kind of menace. His Twittering Machine seems to be about the uneasy alliance between nature and the mechanical, with the distinct possibility that mayhem will ensue. 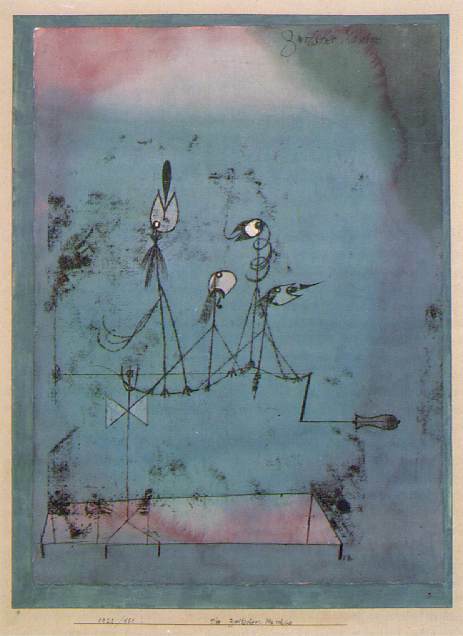 Klee’s nervous, edgy line, contrasted with the soothing blue and violet background, adds another layer of meaning to this unsettling fusion of bird and machine. …the art of putting colors side by side in such a way that their real aspect is effaced, so that familiar objects—the sky, people, trees, mountains, furniture, the stars, solid structures, graffiti—become united in a single poetically disciplined image. The poetry of this image dispenses with any symbolic significance, old or new. 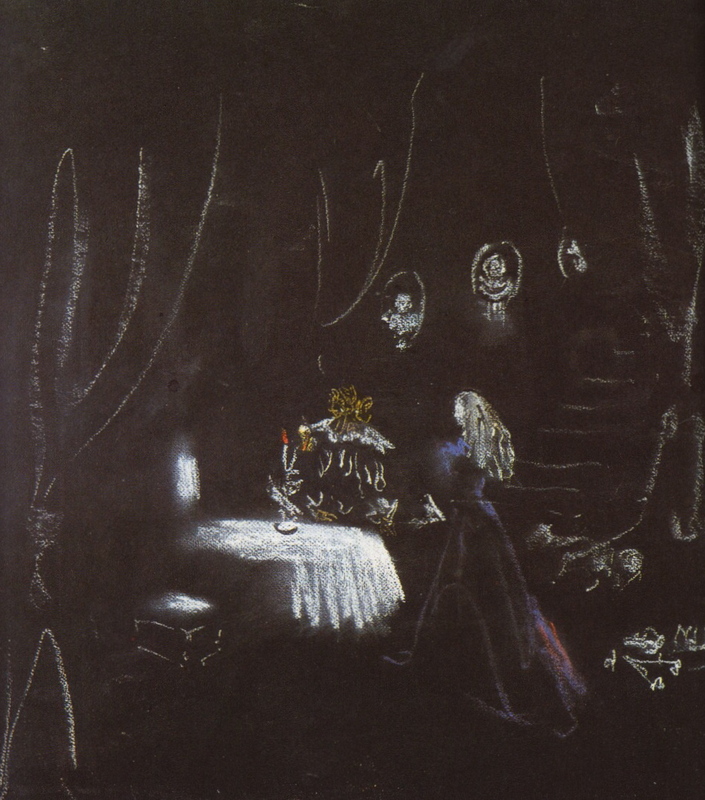 Remedios Varo (1908-1963) was a Spanish-born Surrealist painter who adopted Mexico as her home. 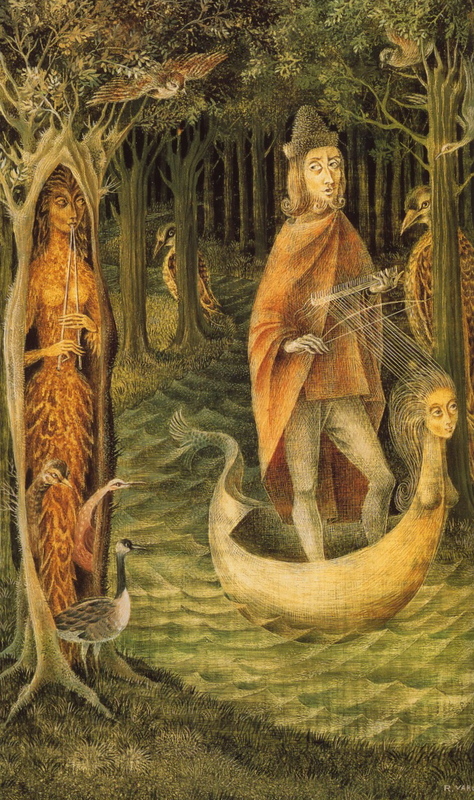 Varo’s imagery was drawn from nature, and she had an intense and abiding interest in science. As a child she often visited the Prado with her father, and it there that she discovered Bosch’s The Garden of Earthly Delights, whose mixture of wit and menace she found inspiring. Birds play a large role in Varo’s personal iconography and appear often in various stages of transformation in her work. American watercolorist and printmaker Walton Ford (1960-) creates beautifully rendered large-scale images of nature gone amok. At first we are seduced by the beauty of the image, then we realize that the work is haunted by a sense of impending doom—something sinister and violent is taking place. 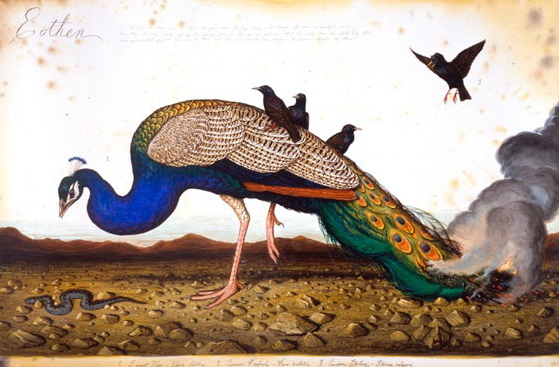 Ford’s work operates on several levels at once, seeming to celebrate the romantic beauty of the work of naturalist John James Audubon while it satirizes colonialism and consumerism, mourns the extinction of species and dispassionately chronicles the destructive forces inherent in nature. 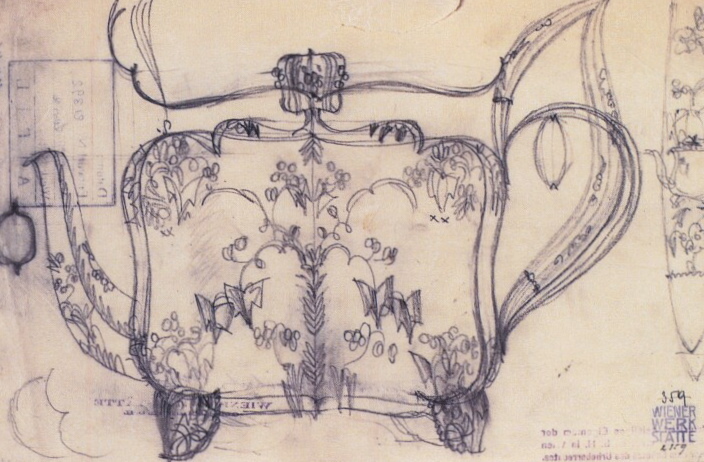 As much as I love textiles and decorative objects, I am often just as attracted to the designer’s drawings, sketches and samples as to the finished pieces. The objects, no matter how beautiful, are immutable, fixed in the here and now. On paper, it is all possibility—often the line work is graceful and sinuous, the colors are rich and vibrant, and the patterns, free of prosaic form, veer toward the abstract. The flatness of the design is part of what I find so appealing. In two dimensions, the objects are not subject to gravity, they represent that most fleeting thing—the creative impulse. 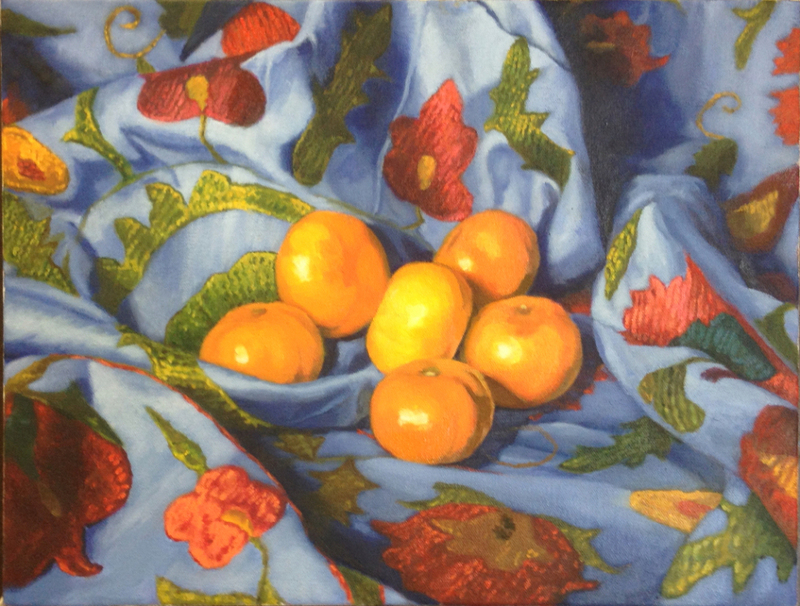 They embody the alchemy of transformation, idea into image, captured in pencil, ink or watercolor. In some cases, as in the designs of James Leman, the delicious yellows and oranges that are so pleasing to the eye represent various shades of metallic thread— which however sumptuous and elegant in the finished textile, is a completely different visual experience. In Leman’s designs on paper, his lyrical line and masterful layering of abstracted botanical images are enhanced by the warm, saturated colors. As patterns, woven in metallic thread on a heavy silk fabric, they are breathtaking and grand, but no longer have the down to earth, fresh from the garden appeal that they have on paper. 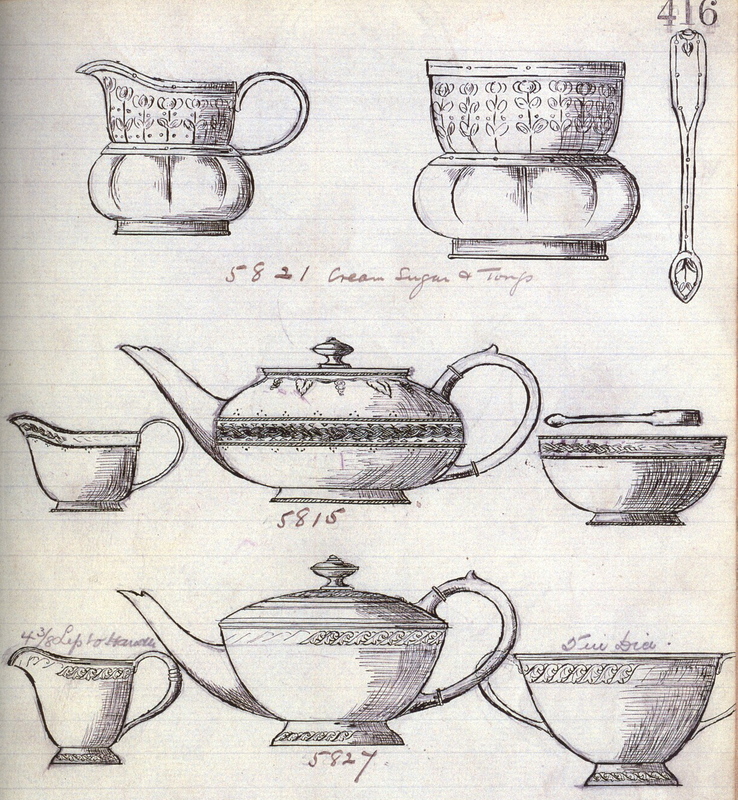 I love the annotations on many of these sketches—dates, yardages, cost calculations, style names and numbers—many are in the artist’s hand alongside the images. They are a decorative counterpoint to the design, often extremely graceful and engaging in themselves. 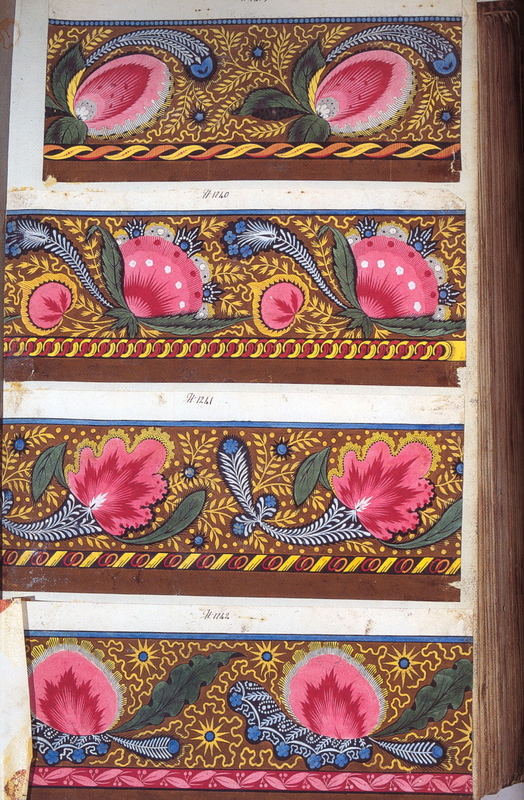 You can also see marks and notations made by the printers, engravers, weavers and dyers—the artisans who actually executed the designs. 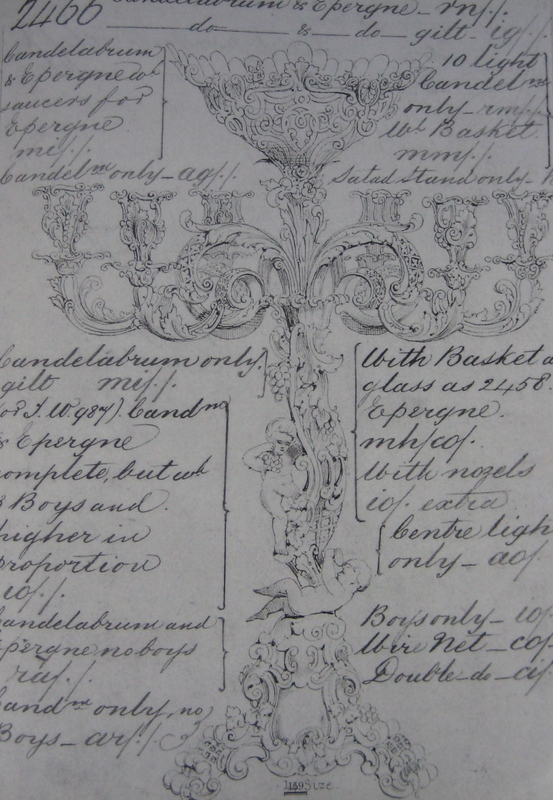 The combination of the drawing and the notations provide a compelling history, tracing the evolution from design to finished product. 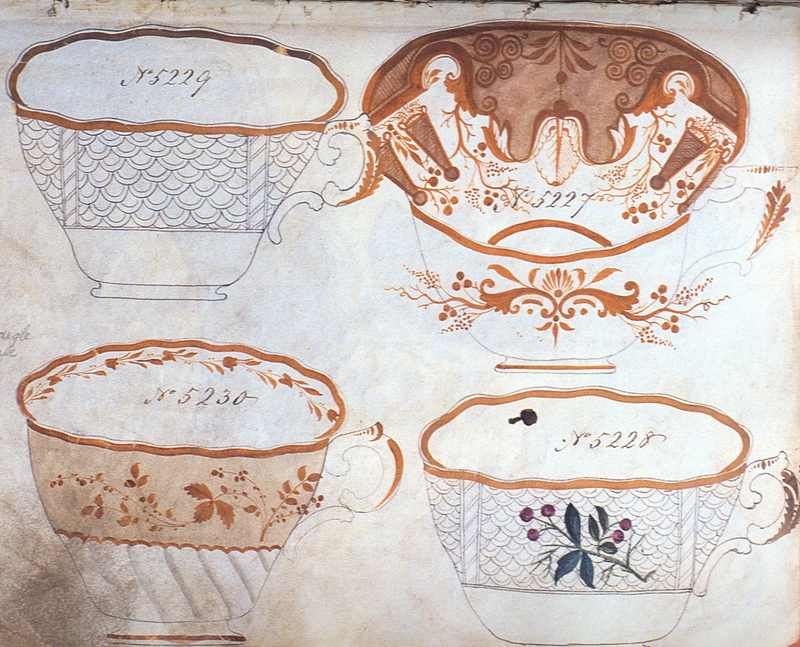 These working sketches were executed on paper, and, at the time they were created, not considered precious pieces to be treated with great care. As a result, the paper is often yellowed and brittle, and you can see smudges, folds, creases and spills. On many of them you can still see the grids and guidelines—another interesting counterpoint to the pattern and design. I don’t see these designs as mere preliminaries, inferior to a perfect, finished object. To my eye, they are works of art in themselves. I’ve restricted myself to designs for decorative objects, tableware, textiles and wallpaper and resisted the temptation to include designs for furniture, architecture and fashion. I have also deliberately not juxtaposed the drawings with the finished objects made from the sketch, because for me these stand as complete works on their own. The designs below, drawn in pencil or pen and ink, are quite elegant and visually stunning. 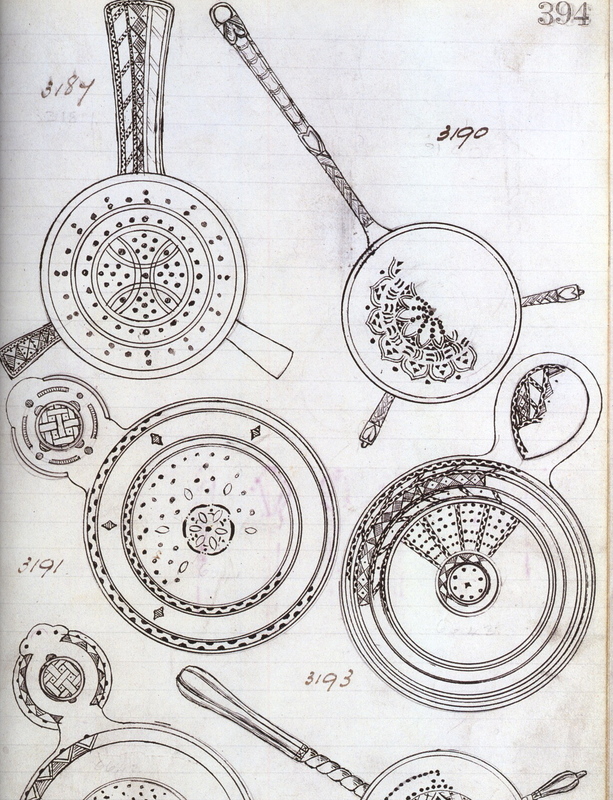 This page of designs for tea strainers is beautifully drawn, patterned and balanced—and could easily be taken for a contemporary abstract drawing. 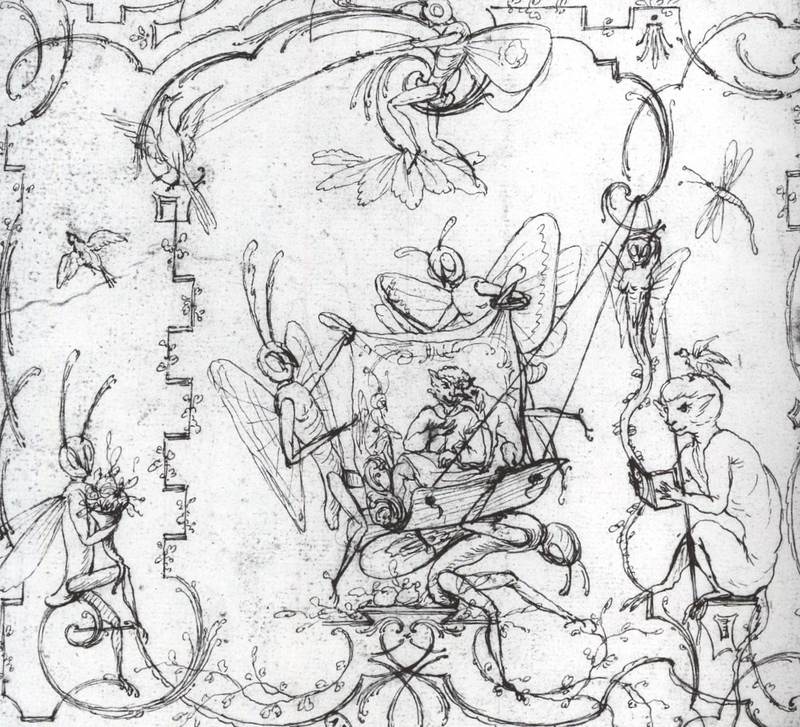 In a narrative vein, this delightful Rococo-style sketch of insect figures, for use as a decorative motif, is playful and lively. This Wiener Werkstätte floor lamp design has a figurative totem-like quality, and is drawn in a loose and graceful style. Dagobert Peche’s sketches always have a flowing, effortless hand-drawn quality—a wonderful contrast to the elegant formalism of the objects made from his designs. 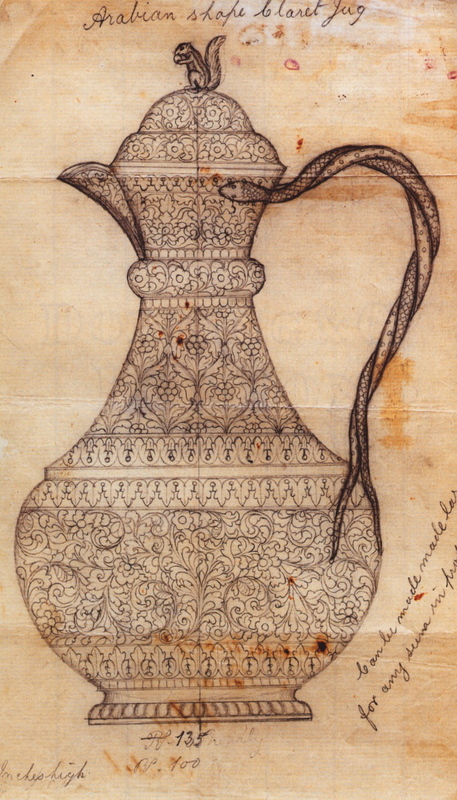 This sketch for a graceful carafe has a very different presence than the finished piece of heavily embossed silver. As an object, the carafe has weight, volume, shine and a beautifully textured surface. 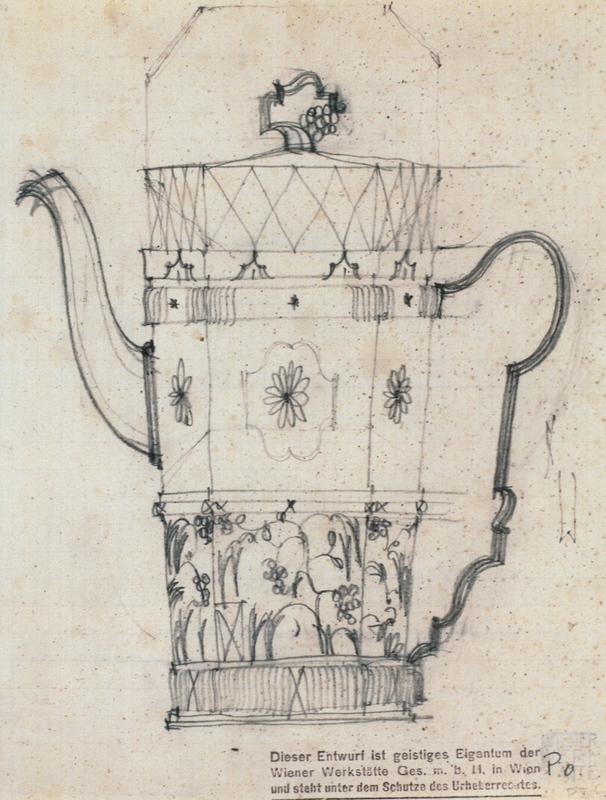 The drawing, flat and decorative, has a very different, wonderful combination of elements. There is a narrative feel to it—the intricate patterning, sensuous curves, twisted serpent handle and amusing squirrel seem to be telling a story. 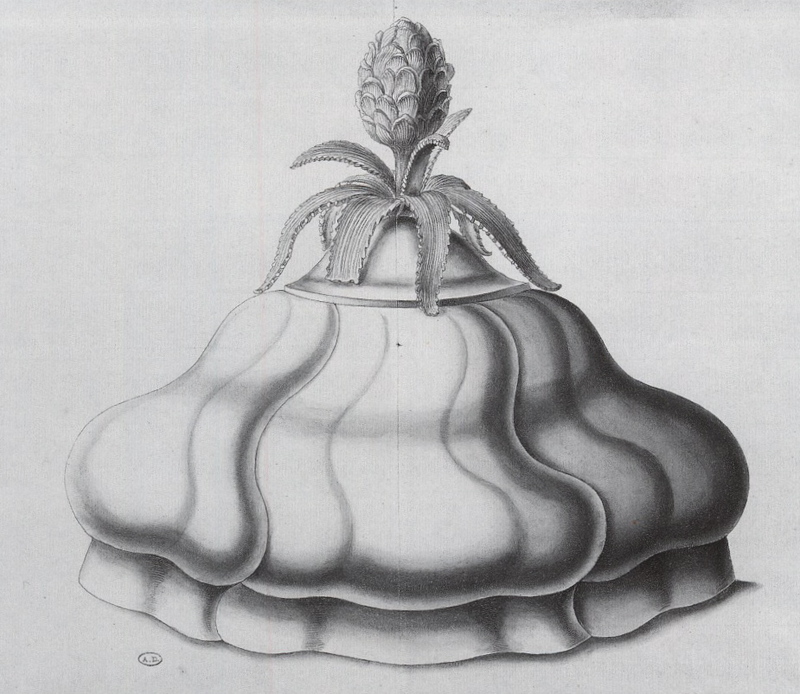 This gorgeous ink and wash drawing of a cloche has so much presence and volume. 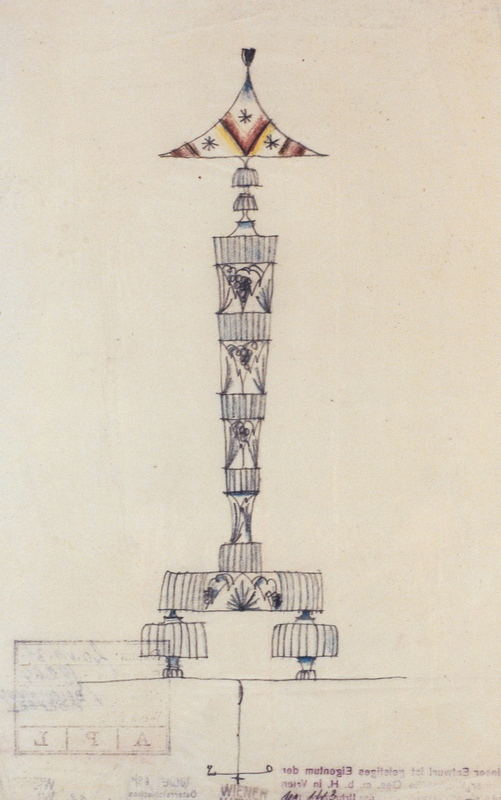 The sculptural decorative element at the top is exquisitely rendered. 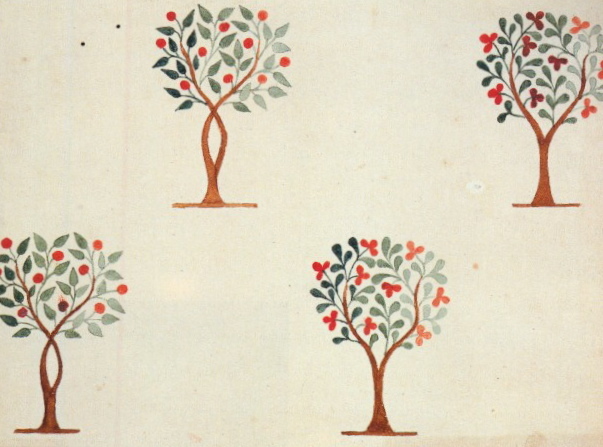 Much of the inspiration for decorative objects comes from nature, as these floral designs for textiles by Anna Maria Garthwaite illustrate so beautifully. These botanical patterns, which take on a seriousness and formality when woven in silk and brocade, are exuberant on the page. 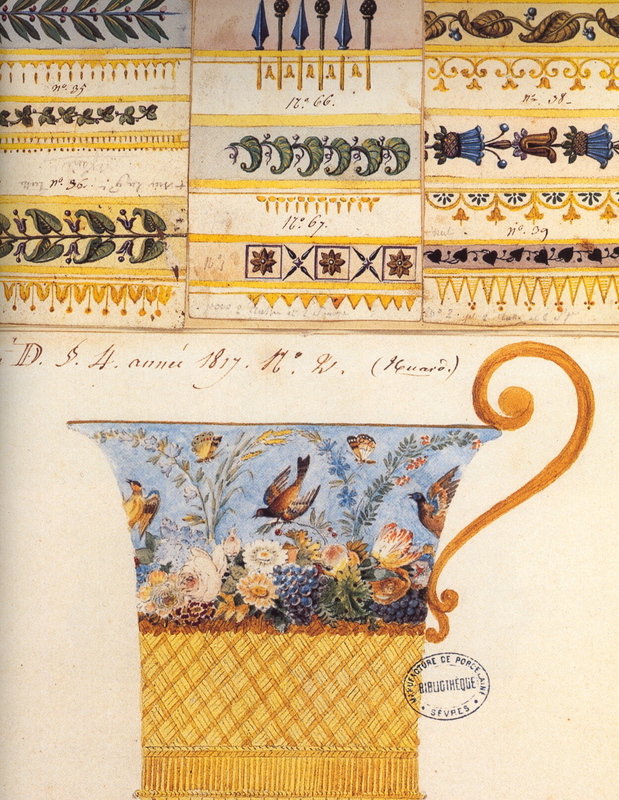 Some of my favorite designs are for tea pots, tea cups and china patterns. They are drawn in flattened-out, foreshortened shapes to best show the designs—you can really appreciate the quality of line, pattern and detail. The decorative motifs are fanciful, lighthearted and graceful—exactly the qualities treasured in a piece of delicate porcelain. 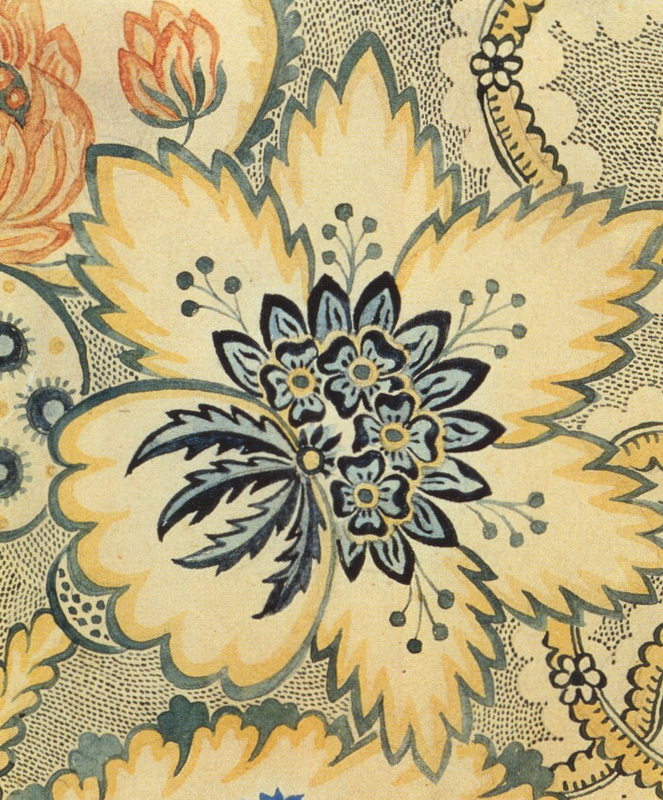 Textile designs are executed in both minimalist and very painterly styles. 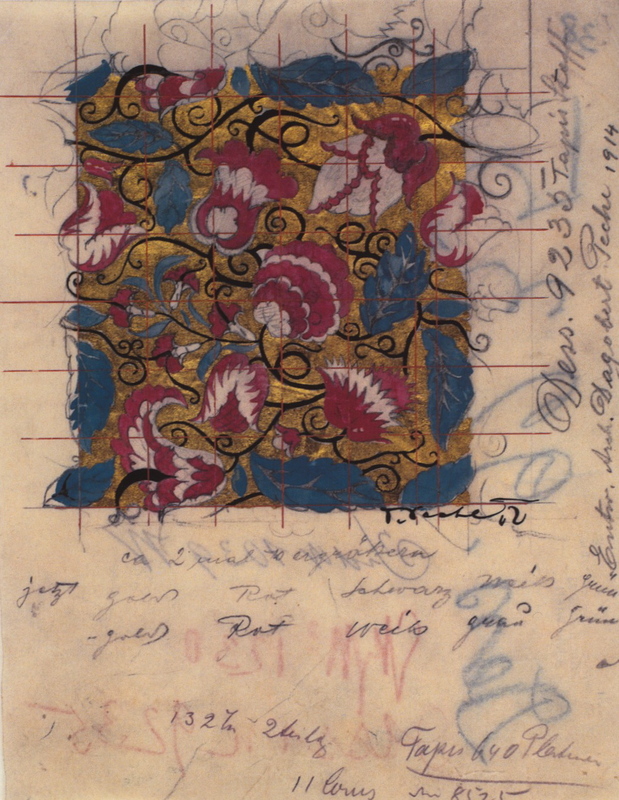 Often you will see only one piece of the design completed painted, with the repeats only sketched in. When the designs are for woven fabric or rugs, you sometimes see the graph paper grids they are sketched on. 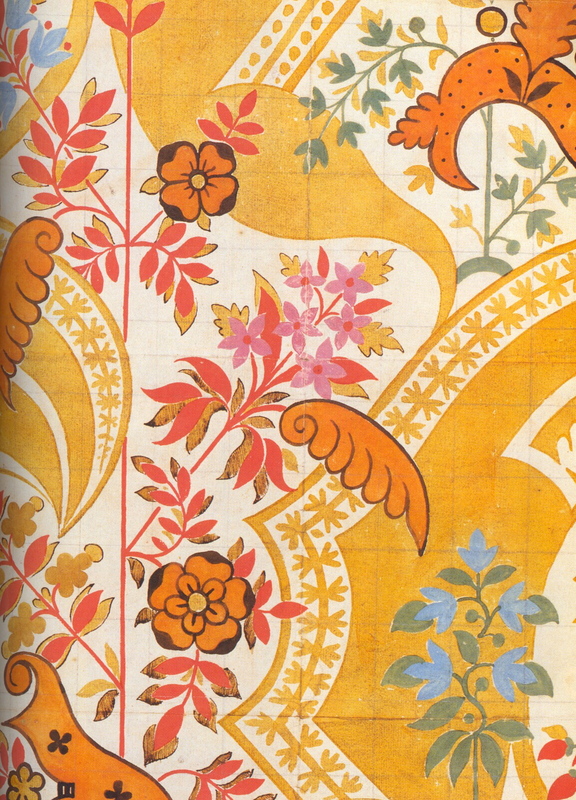 Textile and wallpaper designs were often collected in sample books—some were for companies and/or designers to keep track of their patterns, others were used to market the fabrics. 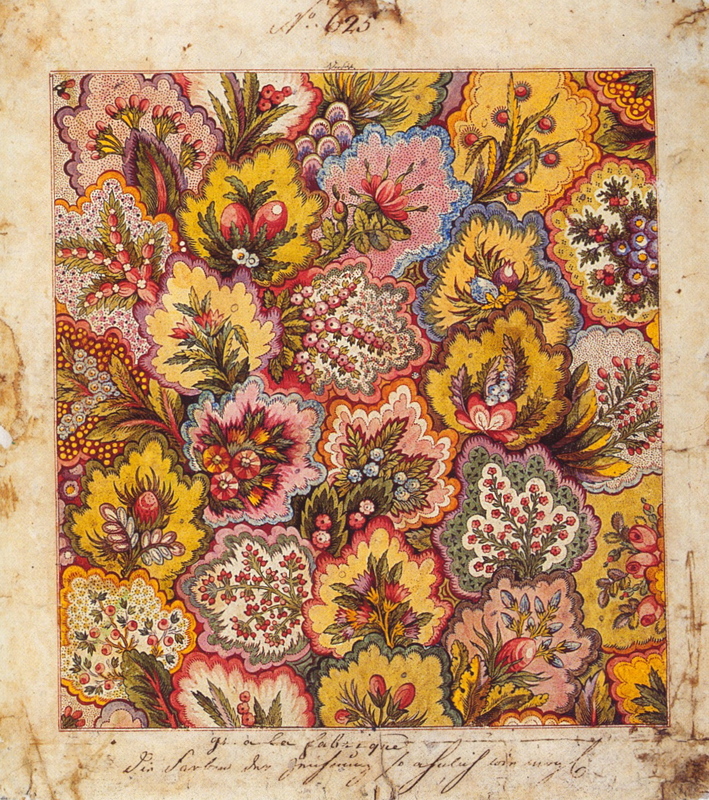 Sample books for textiles, very popular in the 18th century through the 20th century, provide a wealth of information about the history of pattern design, dyeing techniques and the technical means of production. 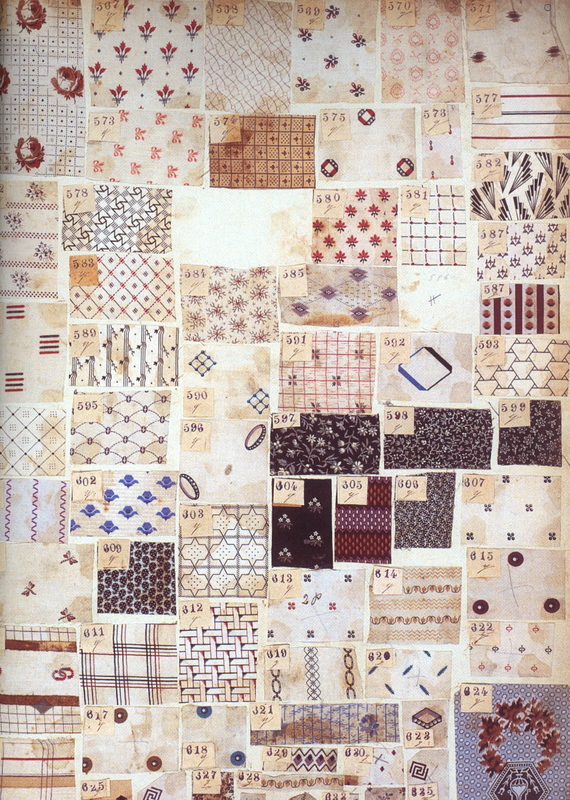 Often they contain swatches of the actual fabrics, shown in the various available colorways. 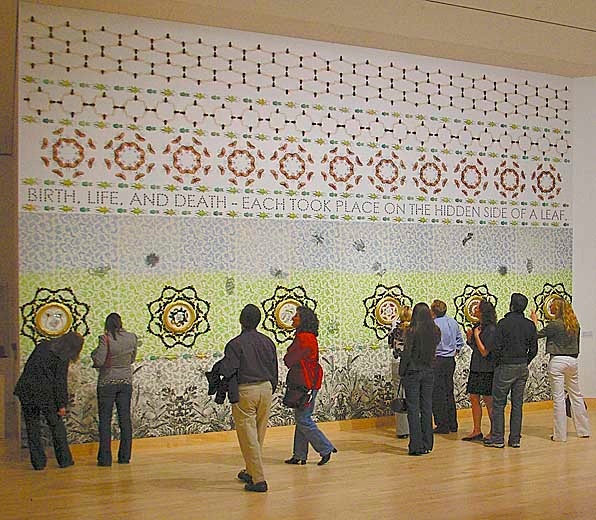 In 2008, the Cooper-Hewitt National Design Museum mounted an interesting exhibition, Multiple Choice: from Sample to Product, that featured sample books for tableware, textiles for interiors and fashion, wallpaper, even buttons. 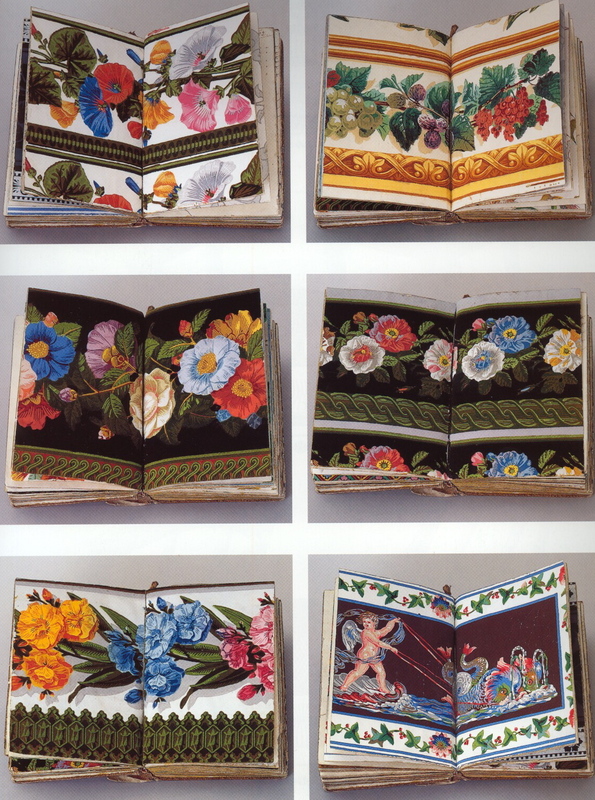 Seeing these lovely books, which contain such a rich visual history, was quite poignant—in the contemporary design world, with electronic formats taking precedence, the paper sample book is truly a thing of the past. 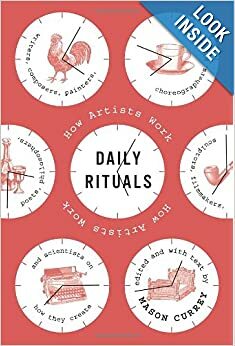 Among the sketches I’ve referenced in this post, many are by well-known designers, others are from an anonymous hand. Some designs were never turned into objects, others are still being manufactured today. But they all continue to live vibrantly on the page, their yellowed and tattered pages still emitting sparks of inspiration. 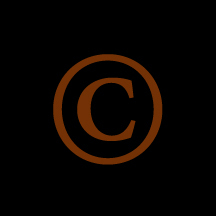 Note: All objects shown in this post are from the Paul Walter collection unless otherwise indicated. The Raj, the period of British occupation in India, lasted from the late 19th century to the early 20th century. 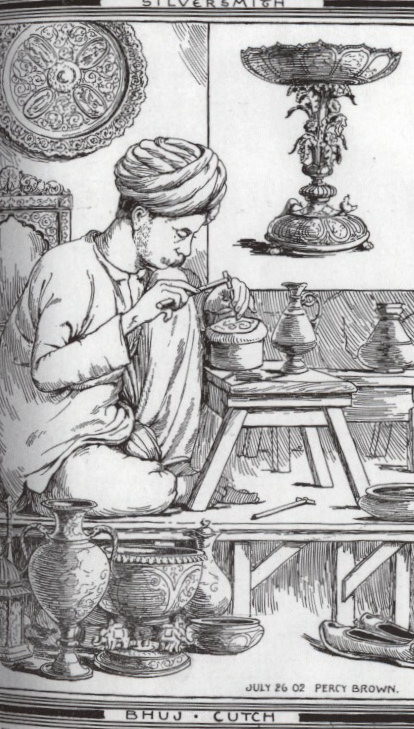 During this time, the silversmiths of India produced an incredible array of beautiful luxury tableware—including tea services, bowls, goblets, ewers, cutlery, gravy boats and card cases. 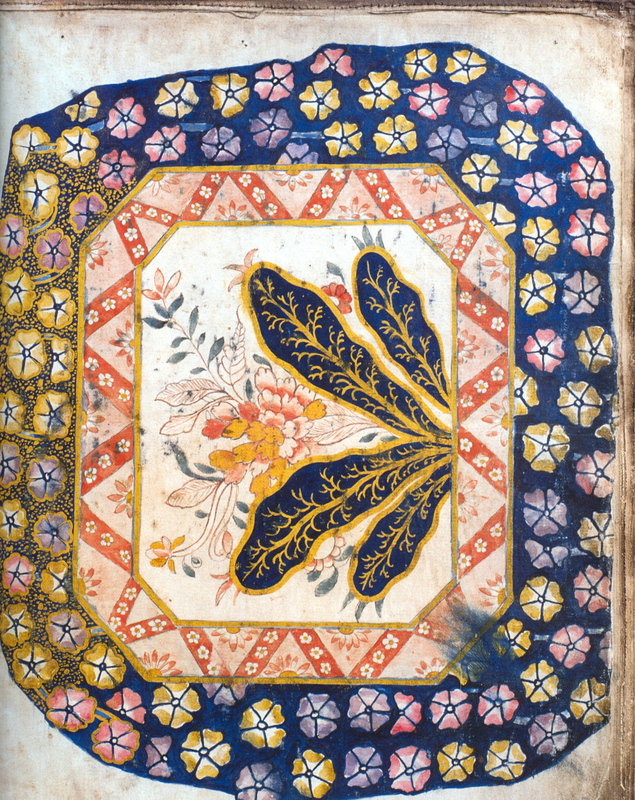 Initially these pieces were made as gifts and for use in the homes of the British in India. They were also exhibited widely in Europe at expositions and shows. 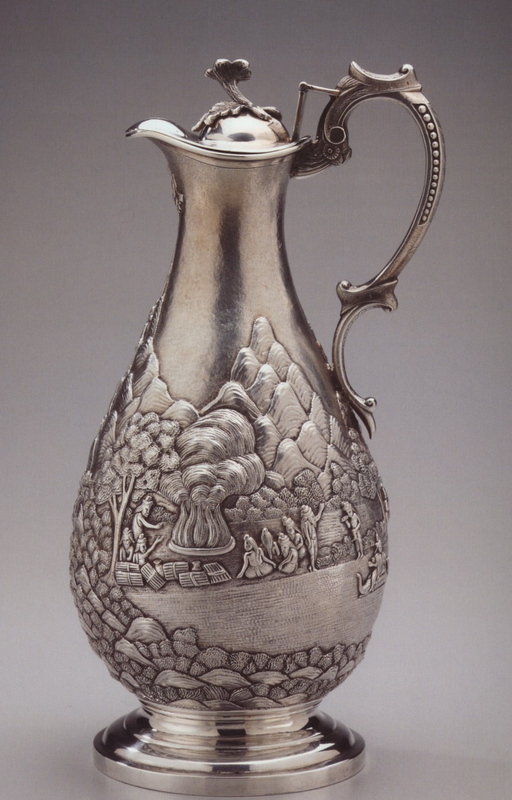 One of these was the Paris exposition of 1878, where the tea service for 12 given by a maharaja to the visiting Prince of Wales (later Edward VII) in 1876 was on display, along with many other examples of Kashmiri silver. 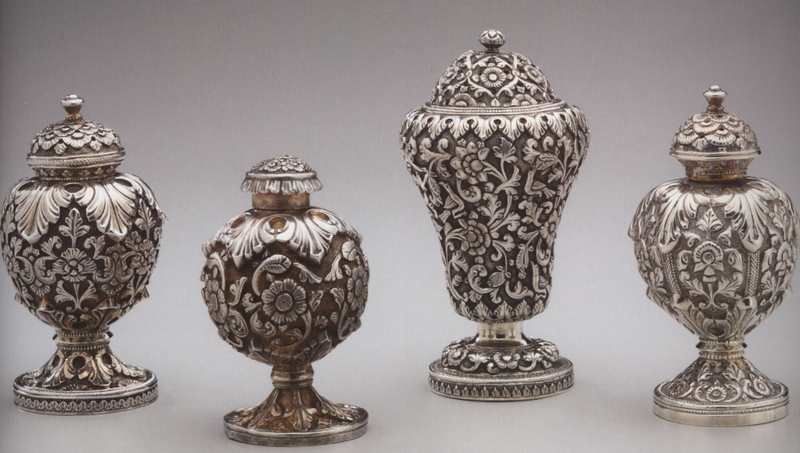 Indian silver soon became very sought-after in British and European markets. 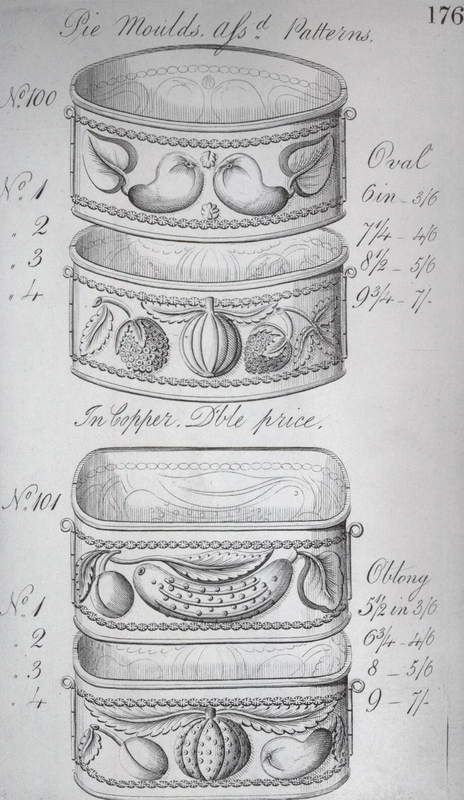 The London establishments Liberty & Co., Regent Street and Proctor & Co., Oxford Street, set up workshops in India to meet the demand. 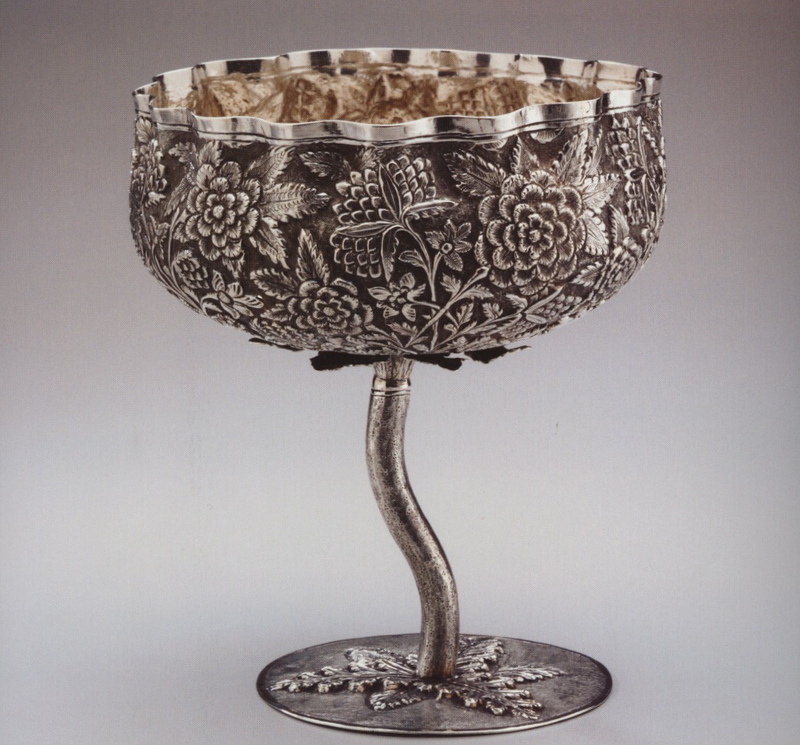 A tradition of European silversmithing had been established in Madras and Calcutta in the 1760s, but by the 1860s the Indian silversmiths had made it their own—wedding their traditional designs and love of embellishment with objects to suit the needs of the British. 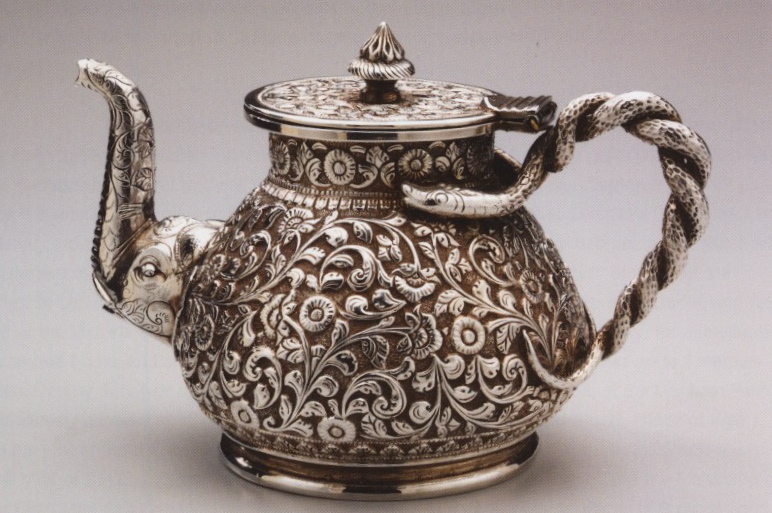 The British love affair with tea began when they came across it in China, and silver tea services had long been a staple in the elegant English home. So when the British came to India and discovered that two of Indian’s greatest natural resources were tea (from northern India) and silver, the result was inevitable. 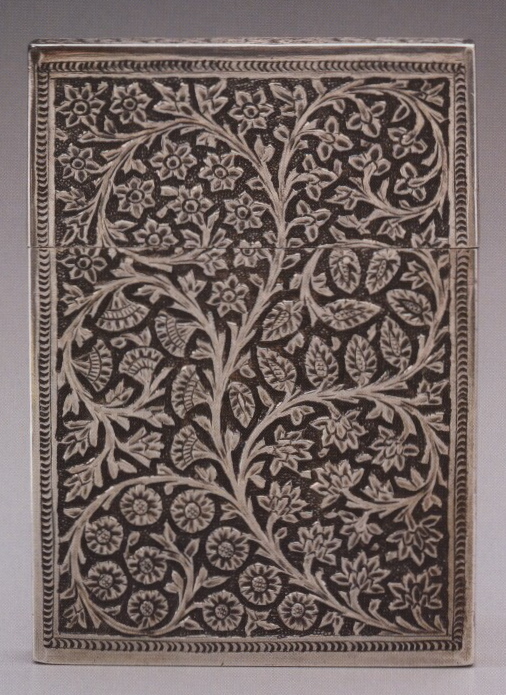 What makes this work so fascinating is the ingenious blending of Indian motifs with western forms. These pieces have tremendous visual interest, intricate detail and texture. 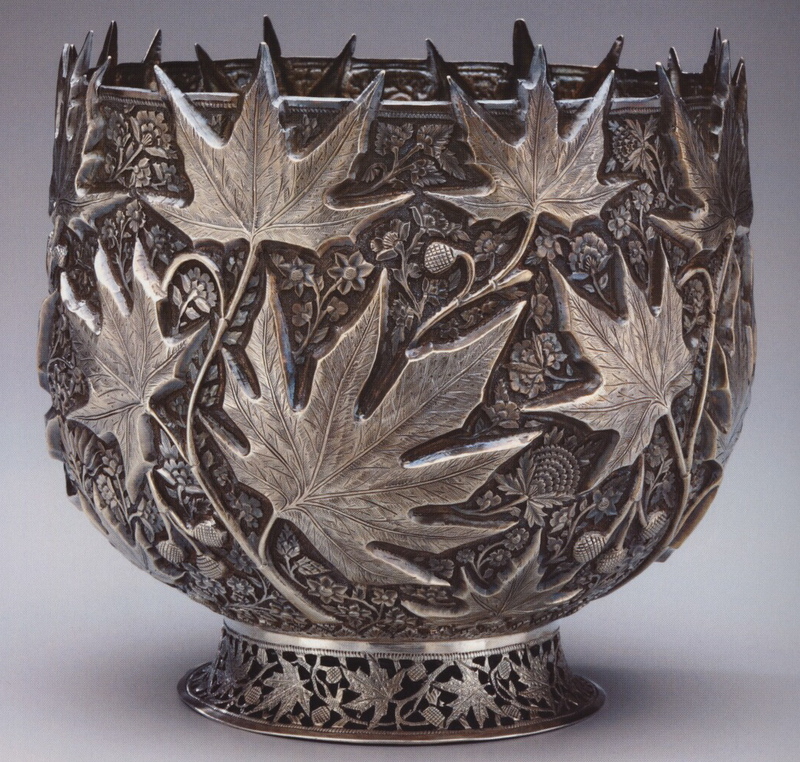 The Indian silversmiths created a wonderful hybrid, objects no longer strictly Indian or western, but an interesting amalgam of the two. 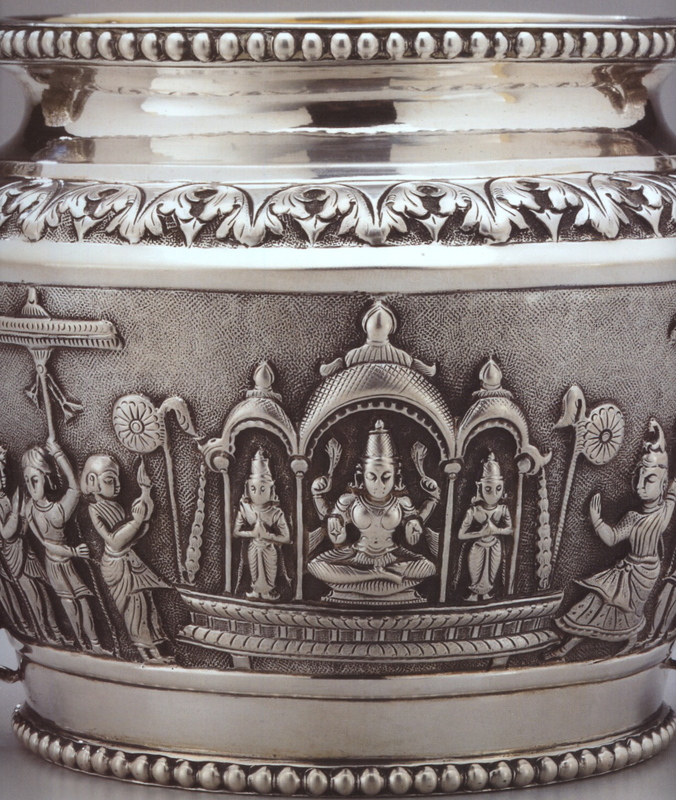 Another fascinating aspect of silver work produced during the Raj is that the various Indian regional design traditions, adapted for these new uses, were reflected in the objects. 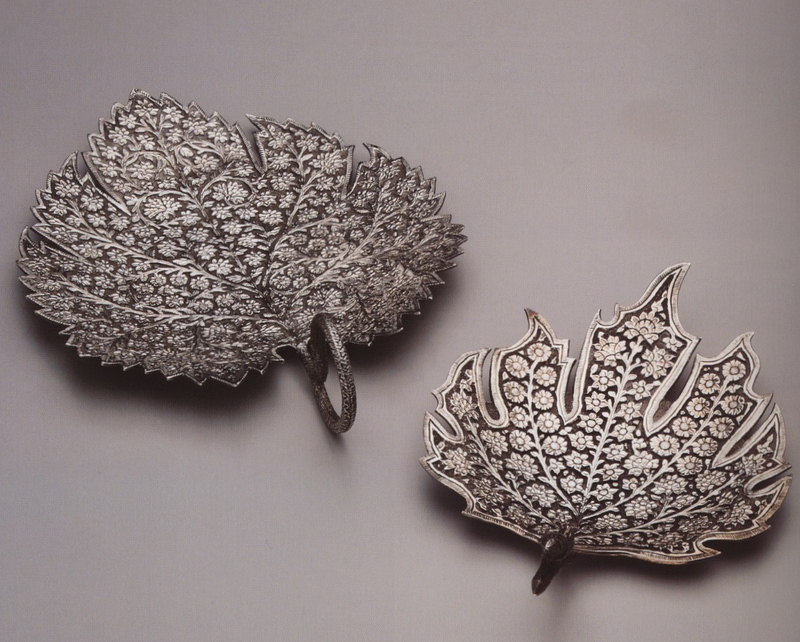 The silver from Kutch in Gujarat, in far western India, is heavily embossed, filled with all-over curves and arabesques. 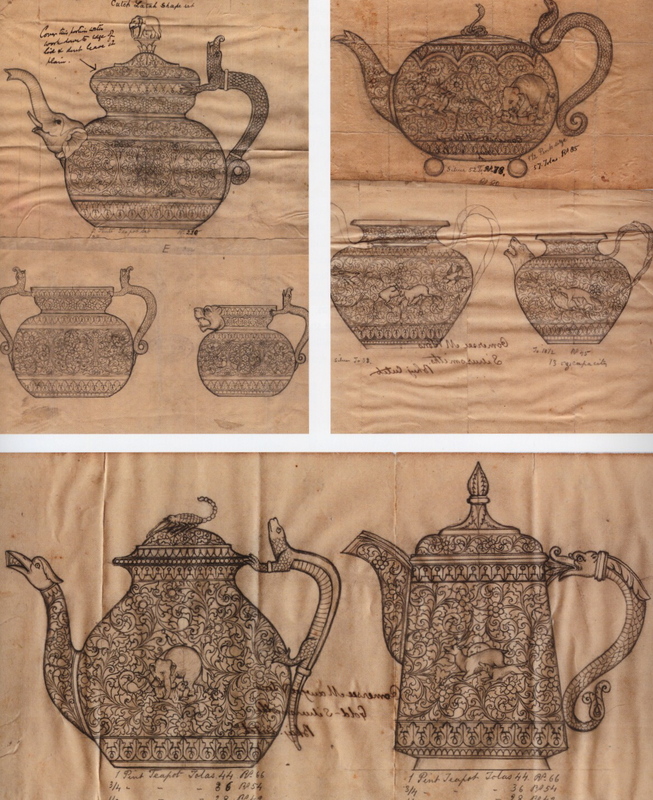 The patterns appear quite abstract and are often embellished with wonderful details such as a tea pot handle fashioned in the shape of a serpent, or a spout in the form of an elephant’s head. 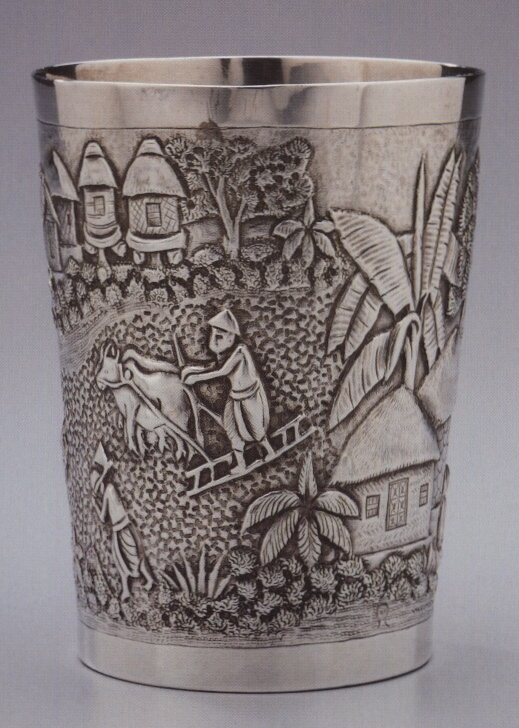 The silver produced in Calcutta contains very different imagery, depicting idyllic scenes from rural Bengali life—workers picking fruit, fetching water, planting or harvesting grain—as well palm trees, and an occasional cow or itinerant holy man. 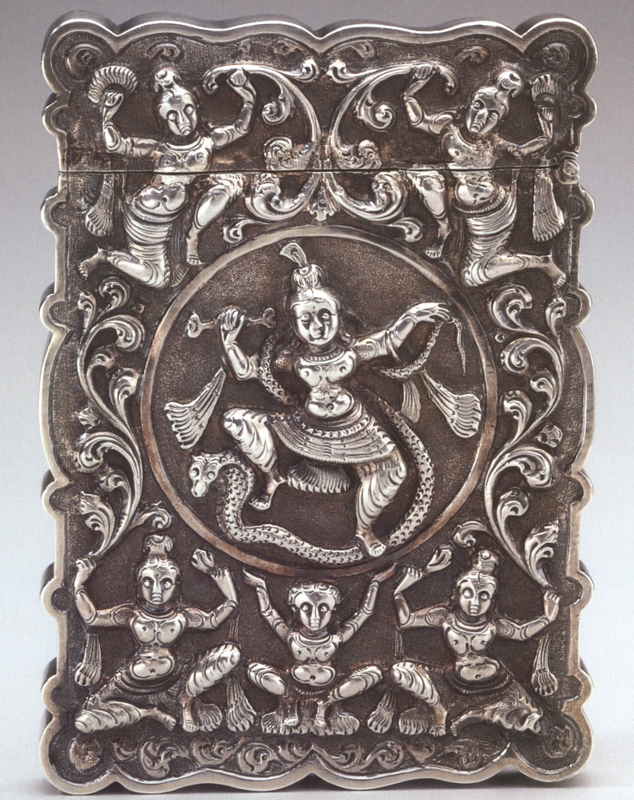 The so-called Swami silver produced in Madras was filled with Hindu imagery—gods and temples, processions and scenes of music and dance. 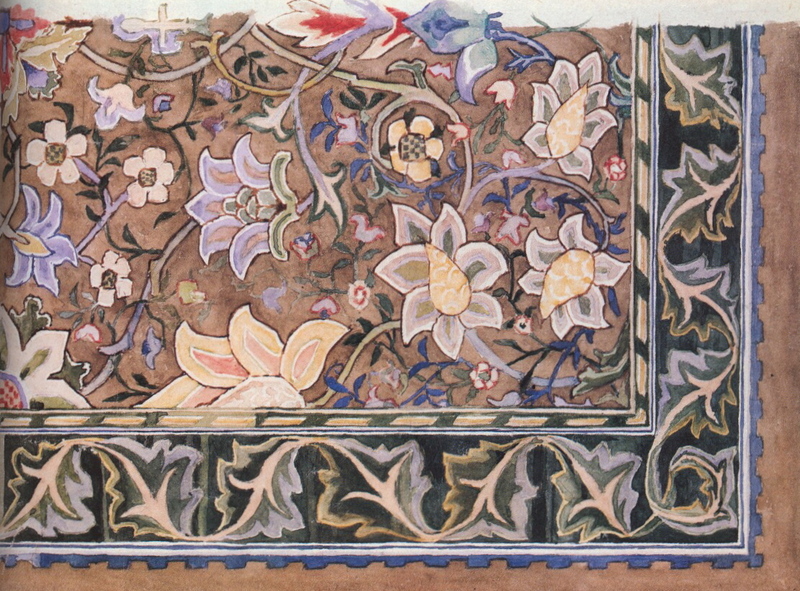 Much of this work was produced by P. Orr & Sons, a British firm established in India in 1876. 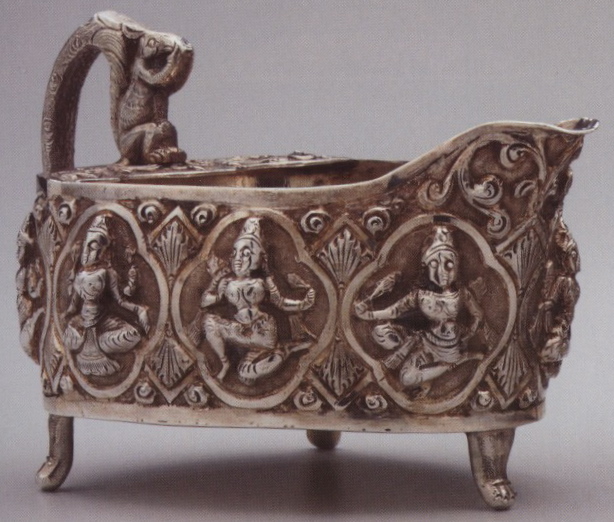 Until the late 20th century, the silver for the Raj, like other art of mixed heritage, was not widely valued by scholars who considered it “impure” and outside classical traditions. Fortunately, aesthetic horizons have expanded in recent years and this wonderful work is now getting the attention it deserves. I’ve been thinking lately about the transformative power of art and its relevance in our troubled world. 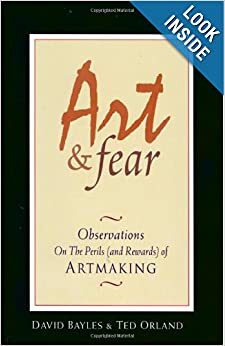 In medieval times, through its connection to the church, art held a more central place in people’s lives, as it sought to enlighten, instruct and relieve suffering. 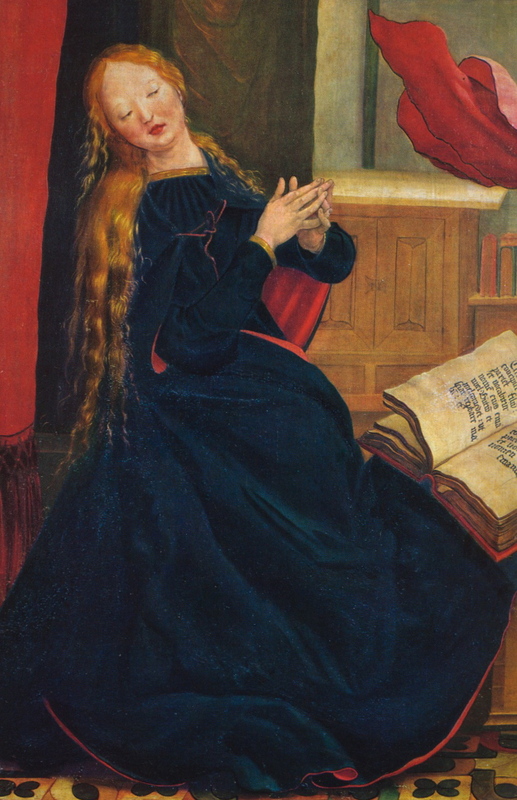 This brought to mind the Isenheim Altarpiece by German painter Mathias Grünewald (c. 1475-1528). The Isenheim Altarpiece embodies the human condition laid bare—from the extremes of catastrophic darkness to the rapture of resurrection and eternal life. The graceful, linear quality of the drawing and the vibrant, expressionist use of color would be enough to set this work apart—but Grünewald’s individualistic iconography and the intense emotional impact of the Isenheim Altarpiece make it completely unique. 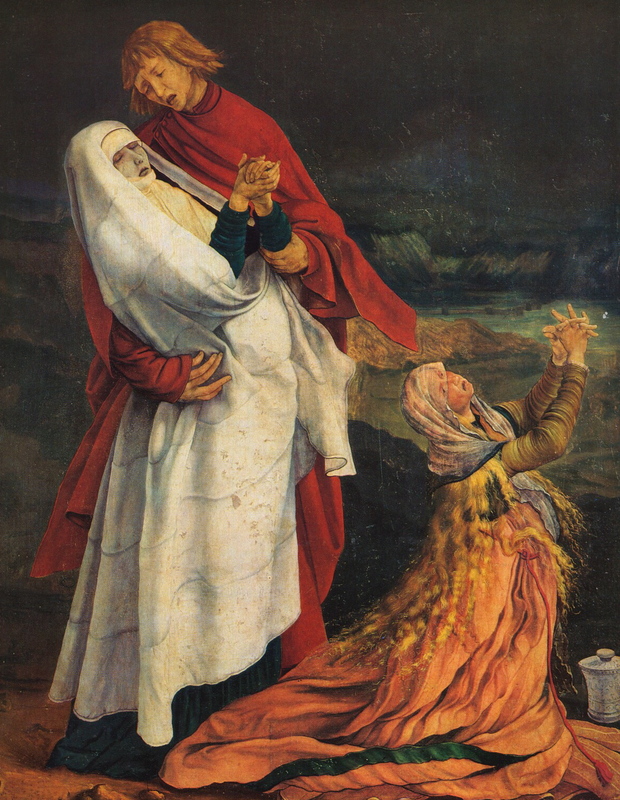 There is also another aspect of the Isenheim Altarpiece which intensifies its powerful spiritual presence—it was commissioned by the monks of a medieval hospital in the tiny hamlet of Isenheim to help lessen the suffering of their patients afflicted with a terrible skin disease called St. Anthony’s fire, or ergotism, which was caused by rye fungus. In a time before painkillers, the patients meditated on Christ’s intense suffering and resurrection to help them cope with their own agonies. The Isenheim Altarpiece, painted on nine hinged panels, contains twelve images, including two sets of folding wings. It can be viewed in three ways. In its closed position—the way it would have been viewed originally on weekdays at the hospital—the central panel shows the Crucifixion, with side panels of St. Anthony and St. Sebastian. The second view shows the Annunciation, the Angelic Concert, the Madonna and Child and the Resurrection. In the third view, a pre-existing carved and gilded wooden altarpiece is flanked by Grünewald’s paintings of the Temptation of St. Anthony and the Meeting with Anthony and Paul. As the panels of the altarpiece were unfolded, the enormous scope of the intense, riveting drama was revealed. 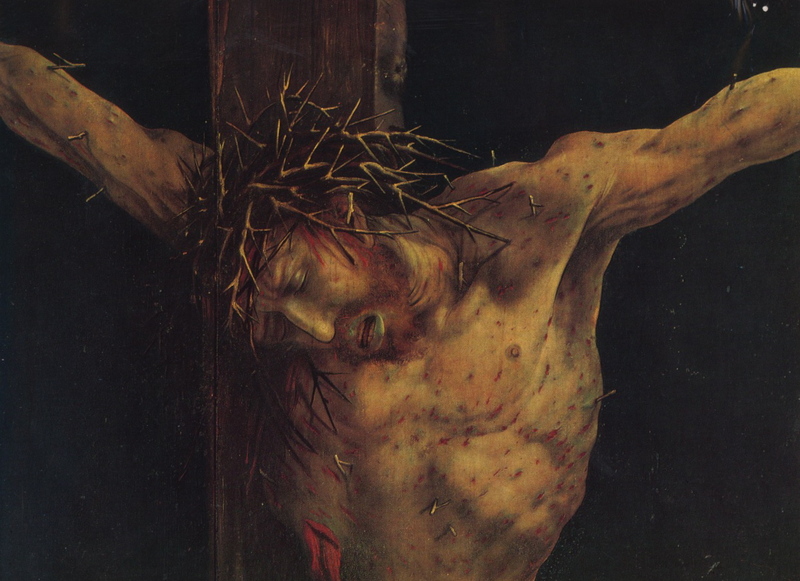 Grünewald’s image of the crucified Christ is imbued with a visceral and emotional intensity. Christ, his skin a grayish green, covered with wounds—has clearly writhed in agony, his limbs twisted, his hands distorted, his head with its crown of thorns hanging painfully on his chest. 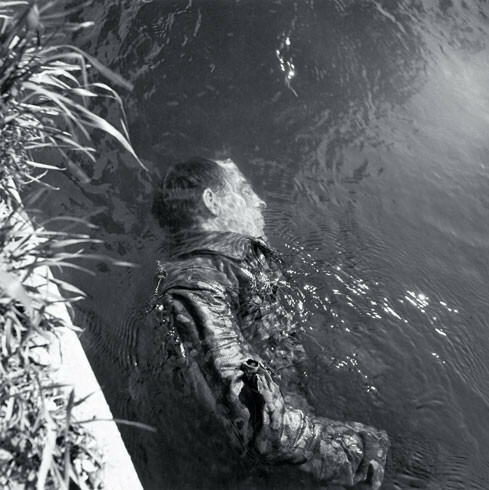 This is a portrait of a brutal, solitary death—the sense of immediacy, agony and isolation is palpable. 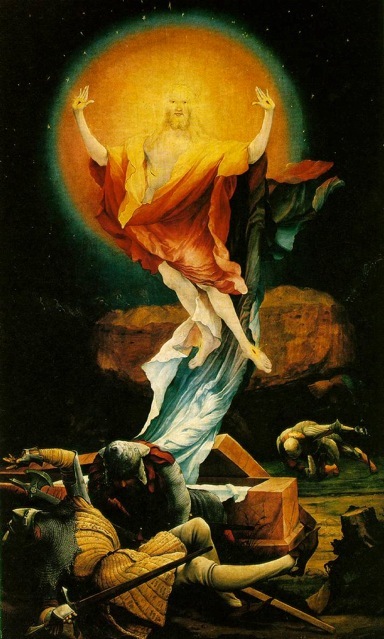 By contrast, the resurrected Christ, surrounded by light, is a triumphant image of the rapture of eternal life. Mathias Grünewald’s real name was Mathis Gothardt Neihardt—the name Grünewald was mistakenly attributed to him 150 years after his death. For a painter who was so well-thought of in his own time, remarkably little information about him has been passed down and few of his works survive—only about ten paintings (including multi-paneled altar pieces) and 35 drawings. All the work that remains is religious in nature. Unlike Albrecht Dürer and the other great German artists of the time, who excelled at woodcarving and other forms of print making, Grünewald only made paintings and drawings, which in itself is very unusual. 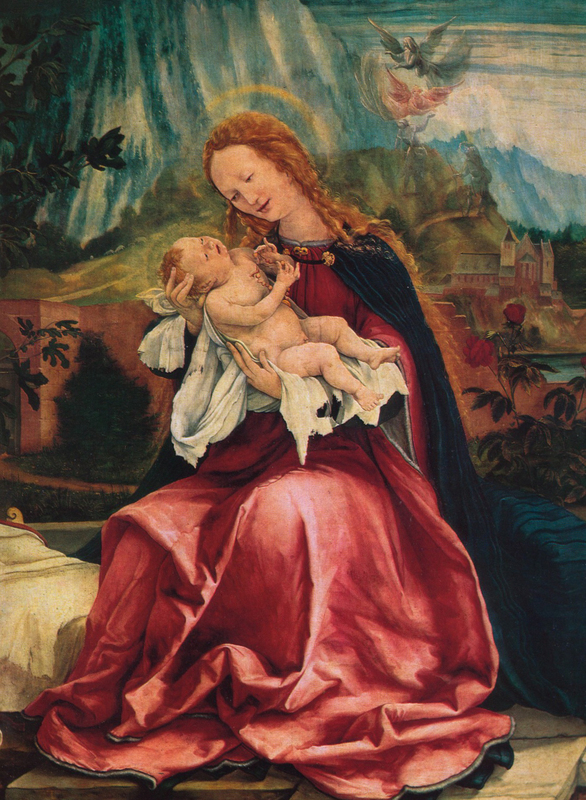 So little was known about Grünewald, that until the 19th century, it was believed that the Isenheim Altarpiece was painted by Albrecht Dürer. What we do know is that by 1509, Grünewald was court painter to the Archbishop of Mainz, and that he was commissioned to paint the Isenheim Altarpiece around 1512-15. Art historians disagree as to interpretations and influences—for example, one categorically states that Grünewald, because of his clear knowledge of Italian painting, must have traveled widely—another asserts he never left Germany. Personally, I don’t think the facts of Grünewald’s life can really do much to explain the expressive, luminous intensity of the work or how he pushed his artistic skill to the point where he could capture so powerfully the tension and emotion of this transformative work. 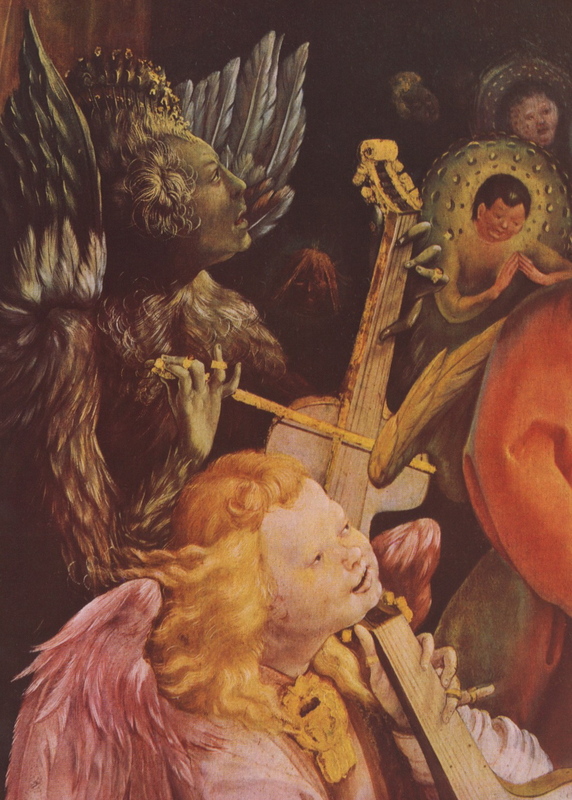 The complex and unusual iconography of the Isenheim Altarpiece is puzzling. The imagery in religious art of the Middle Ages and the Renaissance may seem mysterious to many of us today, but can be easily deciphered by art historians—the reason and background behind every element depicted can be traced, parsed and explained. Not so with Grünewald. Some of his iconography appears to be related to the work of the 14th century mystic, St Bridget of Sweden, whose Revelations was widely read in Germany at that time, but that does not explain all of the unusual visual references. It seems that Grünewald took an eclectic approach not only stylistically, but as regards subject matter as well. Altarpieces were created for one purpose: to embody a specific aspect of generally recognized religious truth. In the process of spiritual meditation the barrier between the viewer and the artistic creation is broken. The Isenheim Altarpiece, in its intensity, tenderness and majesty is the power of this transformation made visible. Like Hieronymous Bosch, Grünewald infuses his work with a highly personal imagination that elicits a strong reaction from the viewer. Grünewald clearly had a knowledge of Central European art from the late Gothic to the beginning of the 16th century, and incorporates elements from these various time periods in a highly original and independent way. There are links to Bosch and Netherlandish painting, as well as intimations of the naturalism of the Renaissance in Italy. Grünewald, on the cusp of the German Reformation, embodies aspects of both medieval and Renaissance art. Unlike the masters of the Italian Renaissance—whose work Grünewald may or may not have seen personally—Grünewald’s heavenly creatures are conjured from light, they are clearly not of this world. 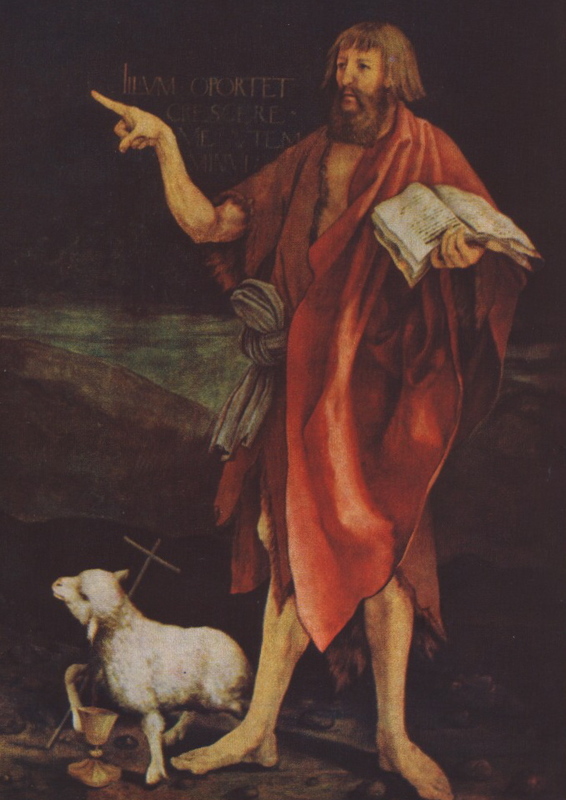 Painters of the Italian Renaissance incorporated spiritual beings into the known world. As an example, see the work of Michaelangelo who was painting the Sistine Chapel at the same time Grünewald was painting his altarpiece. In Grünewald, the supernatural world exists outside the human realm. Grünewald’s masterpiece, forgotten for centuries, was rediscovered by a wider public following the horrors of World War I. At the outbreak of war, the Isenheim Altarpiece was moved from the Musée d’Unterlinden and sent for safe-keeping to Munich. 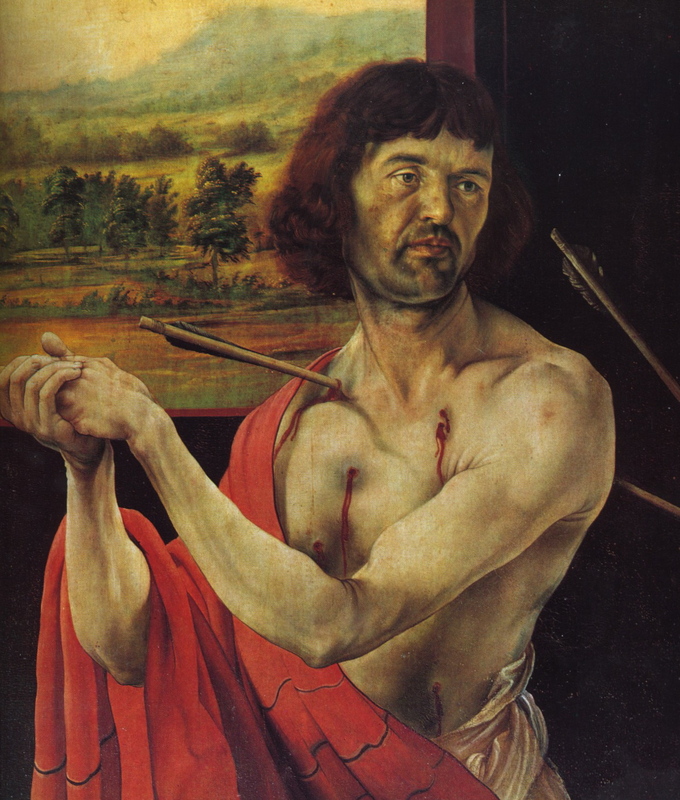 After the war it was restored and exhibited for a time in the Alte Pinakothek before returning to Colmar. The Expressionists, then dominating the art scene in Germany, looked to Grünewald as their forerunner and to the Isenheim Altarpiece as the confirmation of their philosophy. The world, traumatized and overwhelmed by the death and destruction of the war, turned to the Isenheim Altarpiece for solace and inspiration. 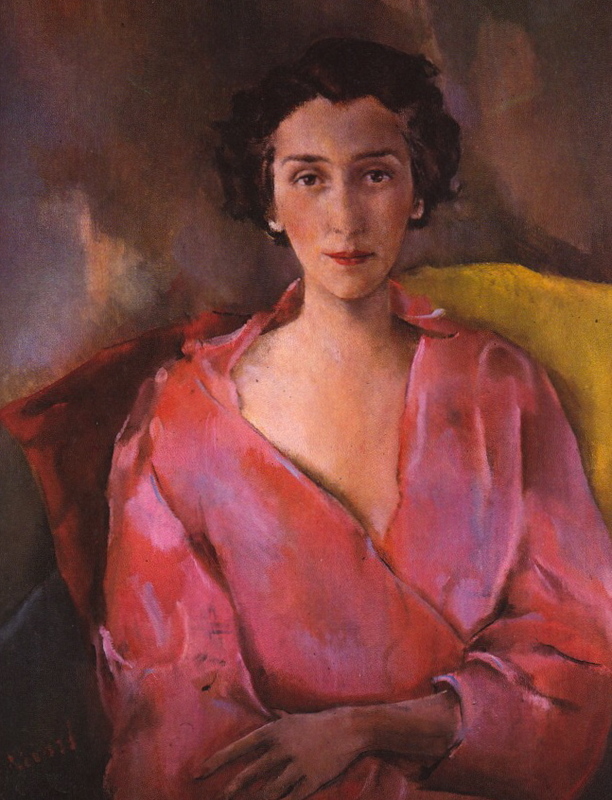 Christian Bérard (1902-1949) was a prodigiously-talented artist, whose tremendous facility across different fields, and his status as the darling of fashionable society in the Paris of the 1920s and 1930s, undermined his reputation as a serious painter. 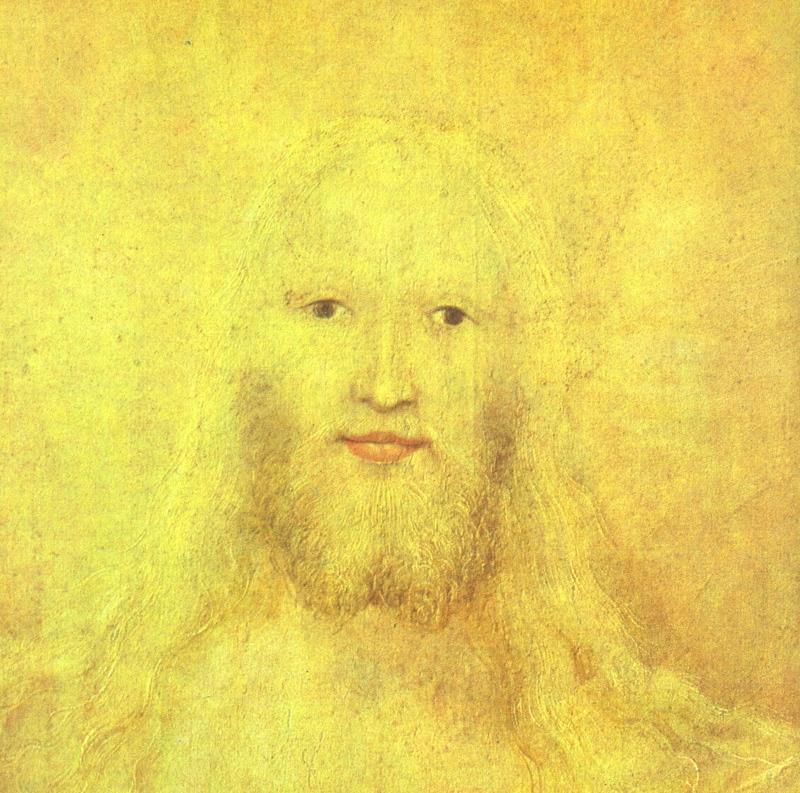 Bérard’s work confounded the critics because his work was unclassifiable—it existed outside the current theories of art, and he interchanged techniques and disciplines. 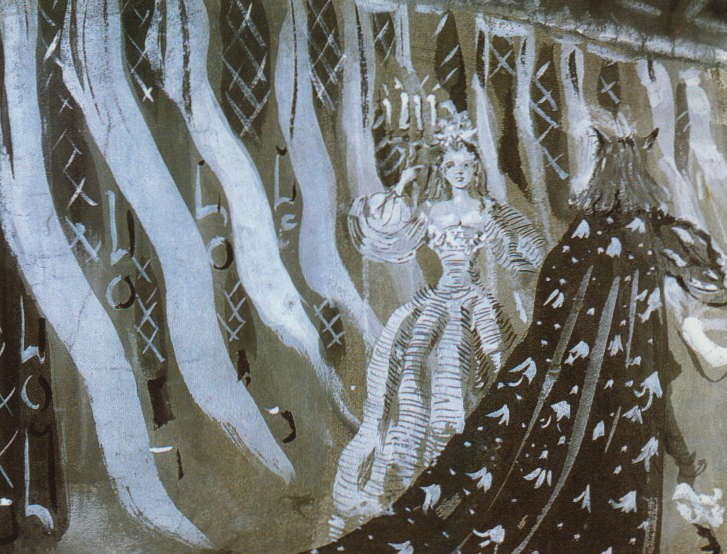 Bérard’s ground-breaking set and costume designs, fashion and book illustrations, murals, decorative screens and interior designs all demonstrated a sensitive, fluid, graceful, elegant line. 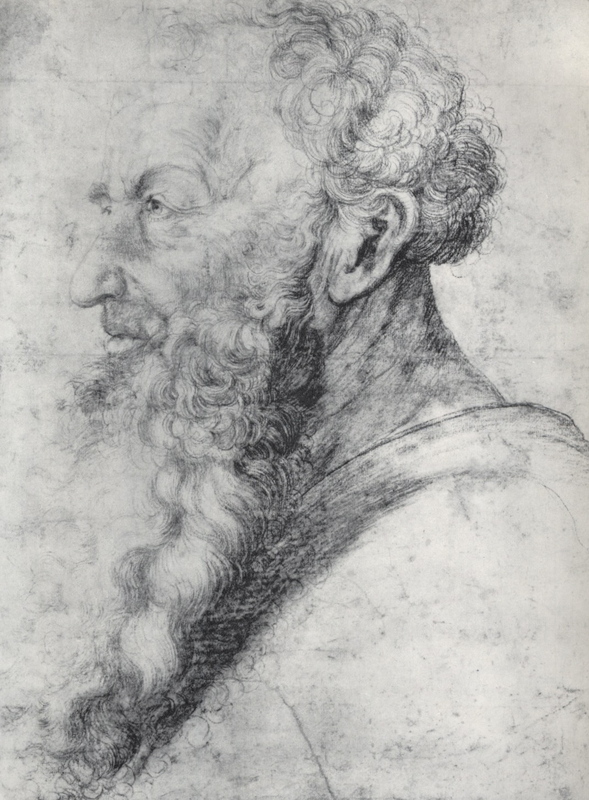 Bérard’s paintings, mostly portraits and self-portraits, added another dimension to his talent as a draughtsman. Painted with insight and great skill, in a neo-romantic, poetic style, they exhibit a deeply-felt humanism. 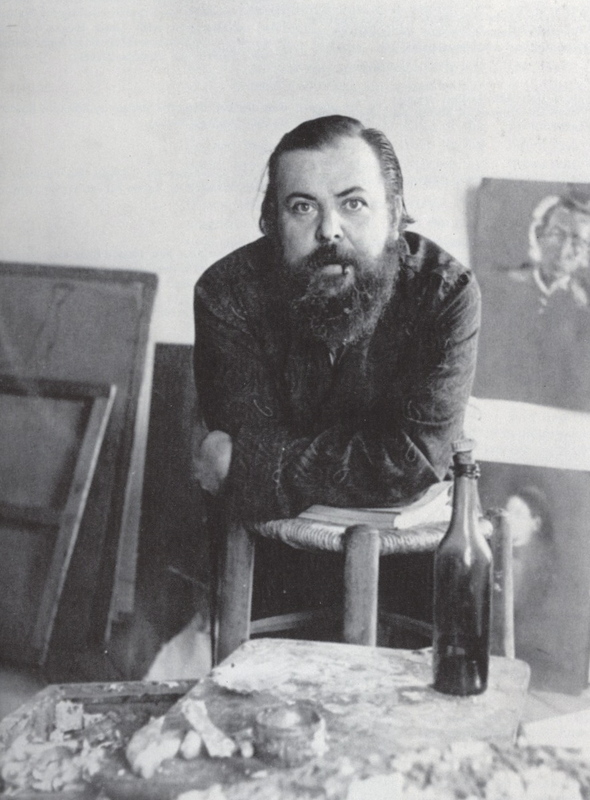 His friend and partner of 20 years, Boris Kochno, remarked that when he was painting, Bérard’s usual childlike exuberance would vanish, and he would work with great concentration and intensity, seeming to take instruction from an unseen third party. Bérard often reused canvases, painting over work he was dissatisfied with—so one can occasionally glimpse ghost-like images, faint faces, emerging from some of his paintings. 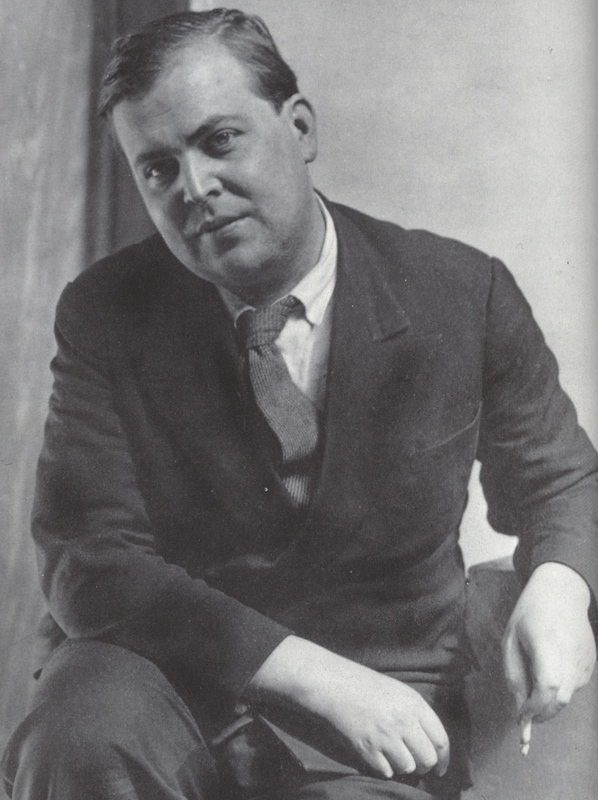 Born in Paris in 1902, Bérard was the son of the official architect of the city of Paris, André Bérard. 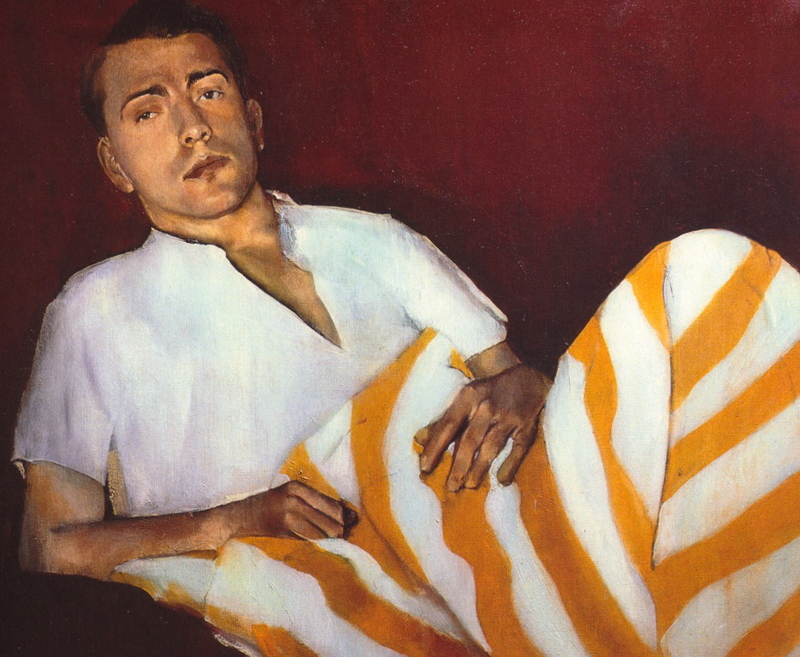 His mother’s early death from tuberculosis was traumatic for the young Bérard. After his wife’s death, the elder Bérard married his secretary, who joined him in the constant disparaging and belittling of his son’s talents, friendships and spending habits. Perhaps Bérard’s life-long desire to please and give pleasure, and his susceptibility to flattery, was a reaction to this early and intense hostility from his family. 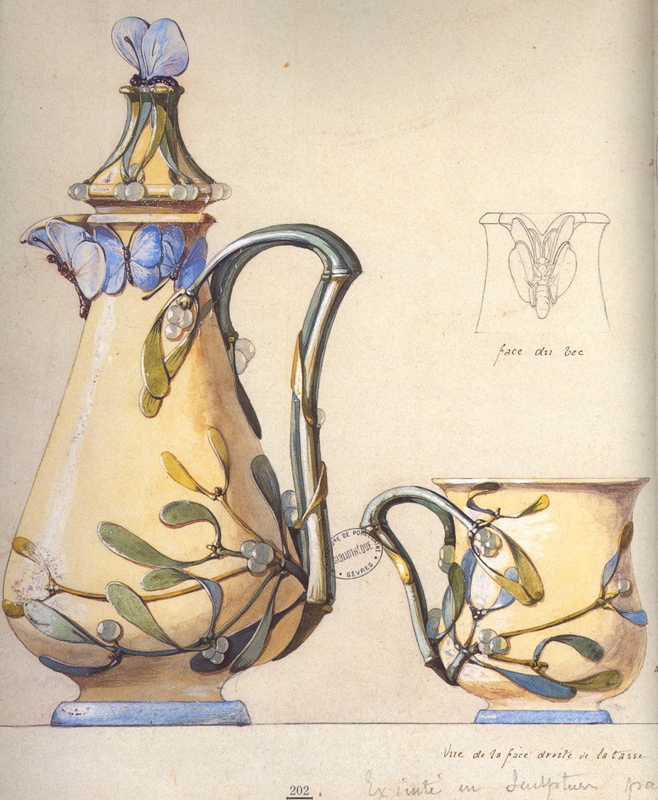 Bérard showed artistic talent at a young age. 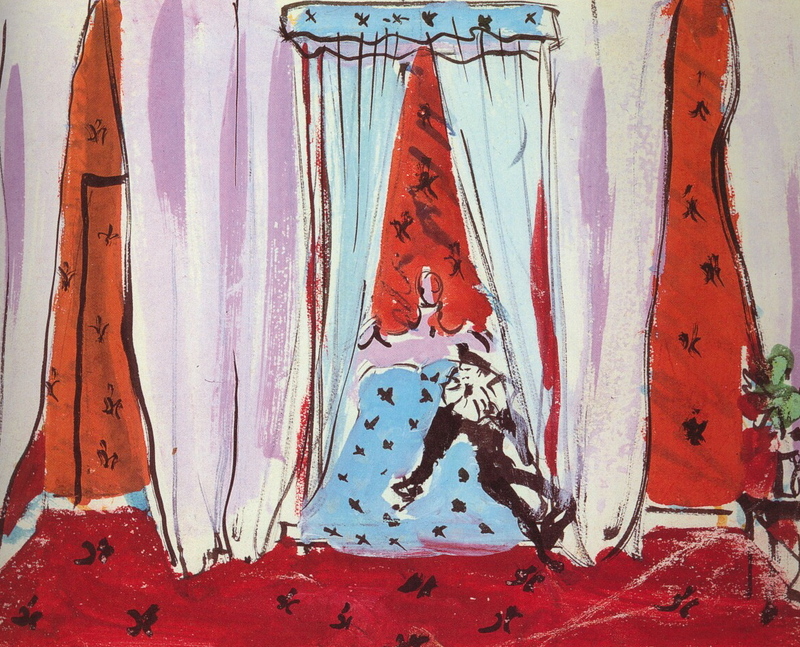 As a child he filled sketchbooks with drawings of ballets and circus performances that he attended with his parents. 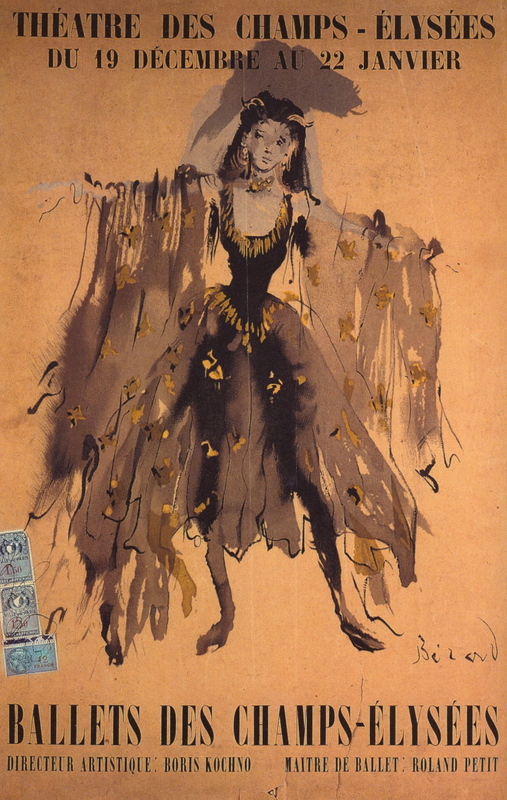 He also copied the couture gowns from his mother’s fashion magazines, which at that time were heavily influenced by the Orientalism of Léon Bakst’s sets for Diaghilev’s ballets. As a young man, he studied at the Académie Ranson with Edouard Vuillard and Maurice Denis and had his first gallery show in 1925. His early work was collected by Gertrude Stein, and he did portraits of his friends Coco Chanel, Jean Cocteau, Cecil Beaton and Horst P. Horst. 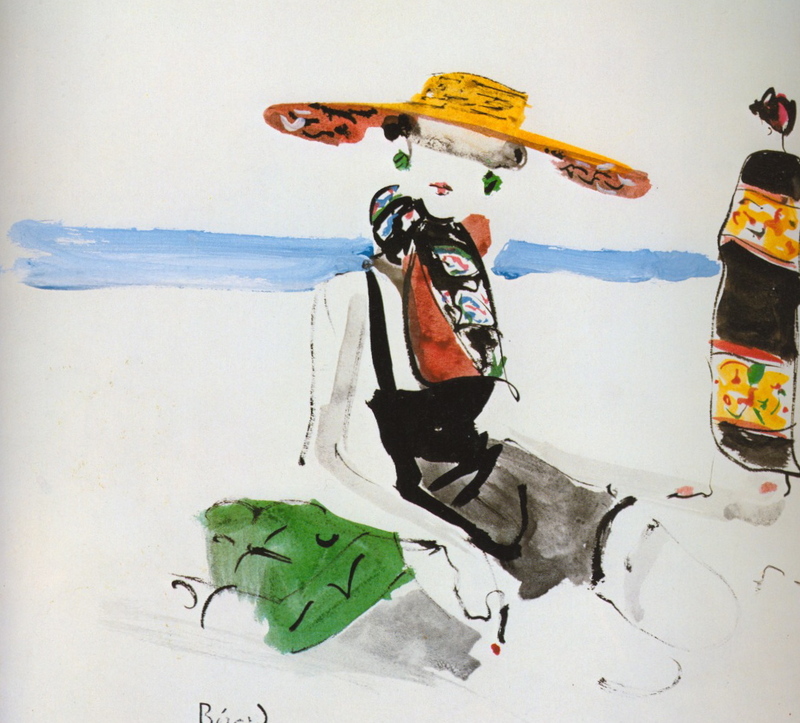 Throughout his career, when he needed the income, Bérard continued to do illustrations for fashion and interior design magazines such as Vogue, Harper’s Bazaar, Art et Style, Formes et Coleurs and Style en France. 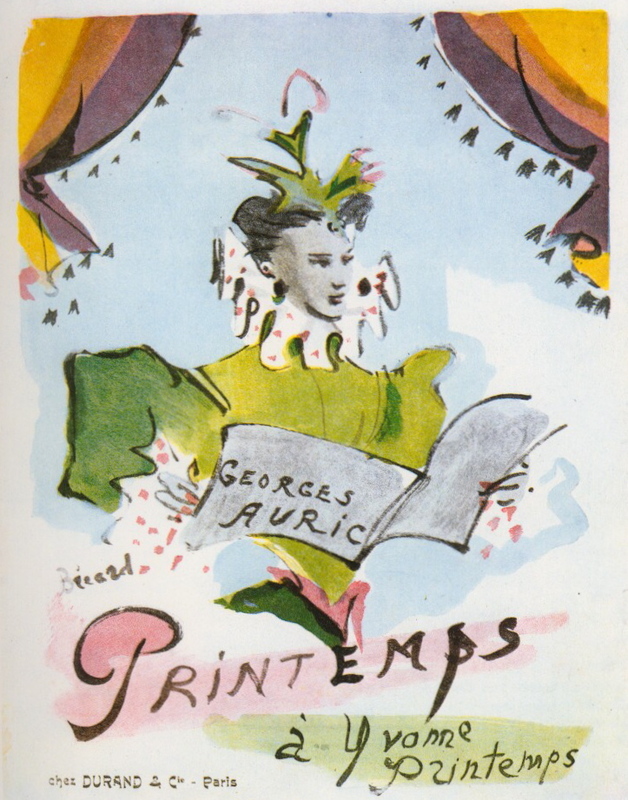 He had a great eye for fashion and style, and his work elevated the art of fashion illustration, updating a Watteau or Fragonard sensibility for women’s fashion to the styles of the 1930s and 40s. His work often inspired the couture collections of designers like Christian Dior, Elsa Schiaparelli and Nina Ricci. 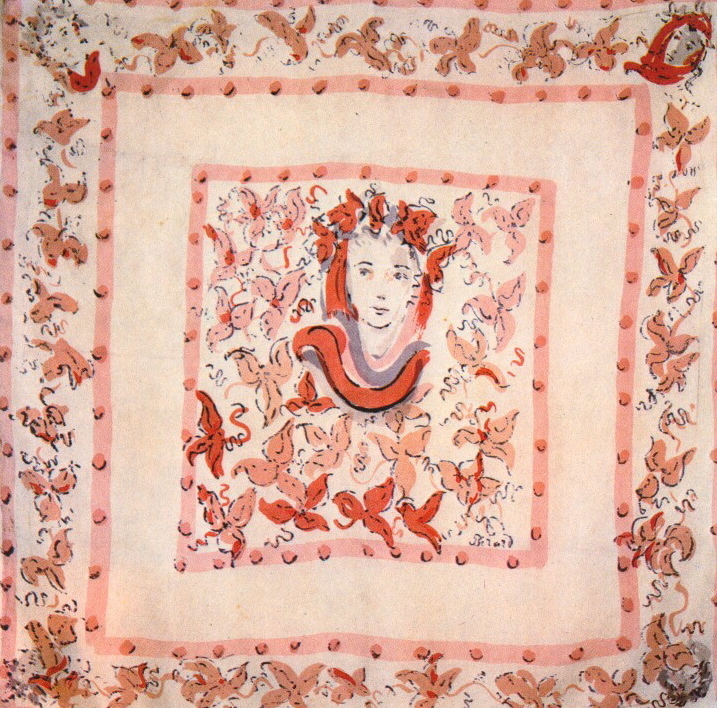 Bérard also did some interior decoration and textile design—painting murals and decorative screens, designing rugs—as well as a line of scarves for Ascher Silks, London. Christian Bérard, illustration, beachwear for Schiaparelli, n.d.
Bérard also continued to do illustrations for theater and ballet posters, music scores, and advertising throughout his life. 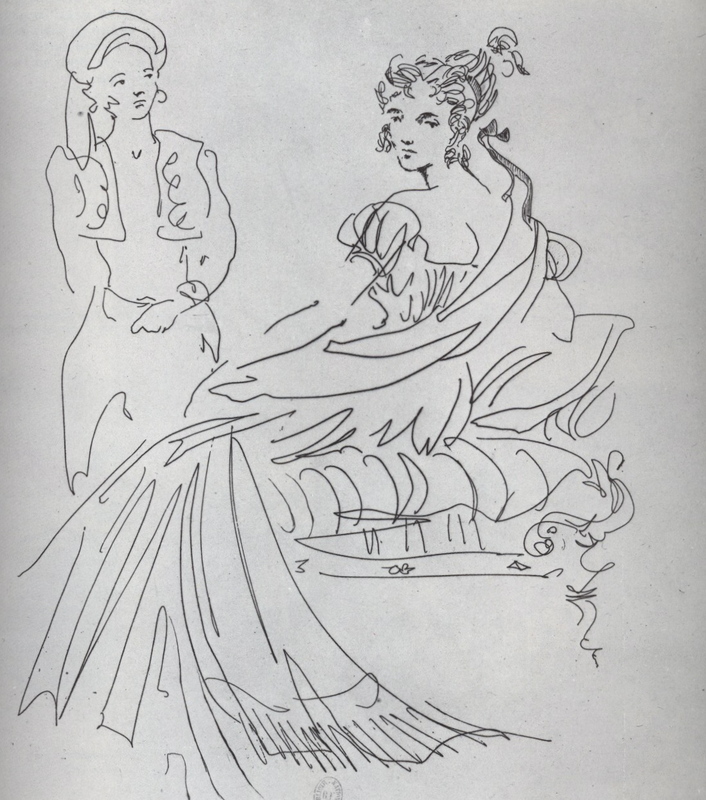 Christian Bérard, Sketch for an illustration of Gigi by Colette, n.d.
Christian Bérard was a large man, with fair hair, luminous blue eyes, and a rosy plump face that earned him the nickname Bébé, given to him by his friends because he resembled the baby in an advertisement for soap that was currently up all over Paris. 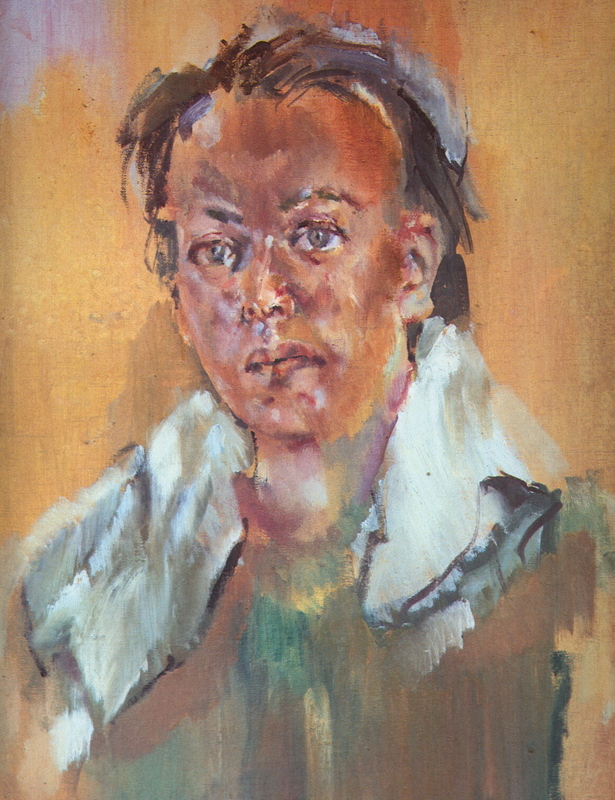 Bérard’s appearance was often disheveled, he would stride into Maxim’s or other society nightspots in tattered paint-spattered smock and torn coveralls, with a large patterned scarf flung dramatically over his baggy workman’s jacket. Boris Kochno also recounts long walks through Paris at night—Bérard constantly noticing and pointing out glimpses of magical scenes, almost like a conjurer. Bérard never lost his childhood enjoyment of carnivals and street fairs and threw himself with great enthusiasm into the constant round of costume parties given by his friends. 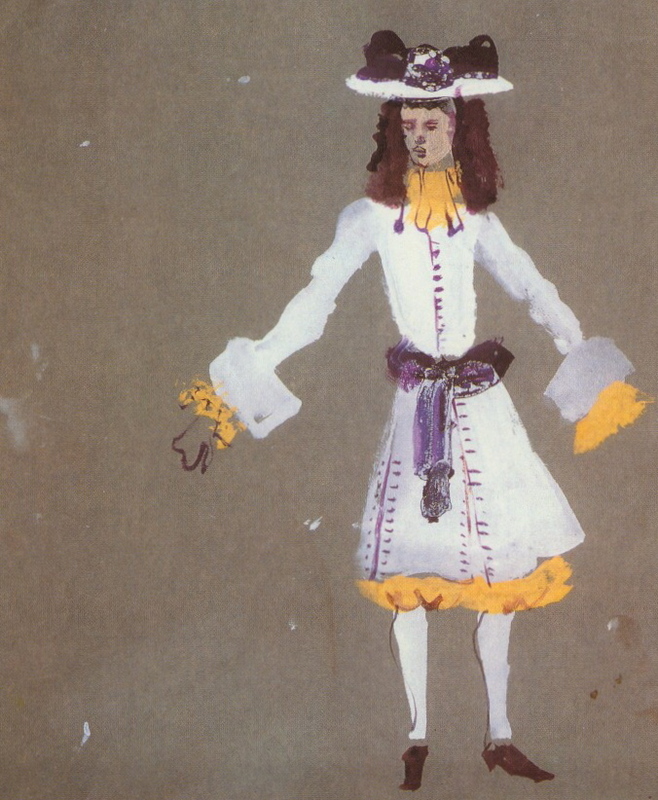 He excelled at spontaneously creating costumes from fabrics and items at hand. 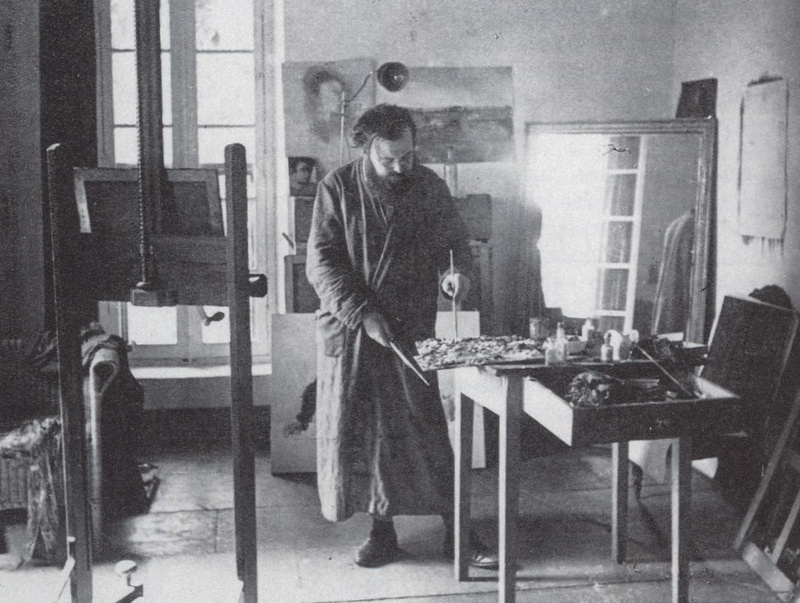 When agitated or absorbed in his work, Bérard could be very clumsy, and he could turn a well-ordered room into chaos in short order—leaving a wake of crumbled papers, overflowing ash trays, and stepped-on tubes of paint. He was also extremely witty and charming—his spontaneity, kindness and charisma made him very popular in fashionable circles. 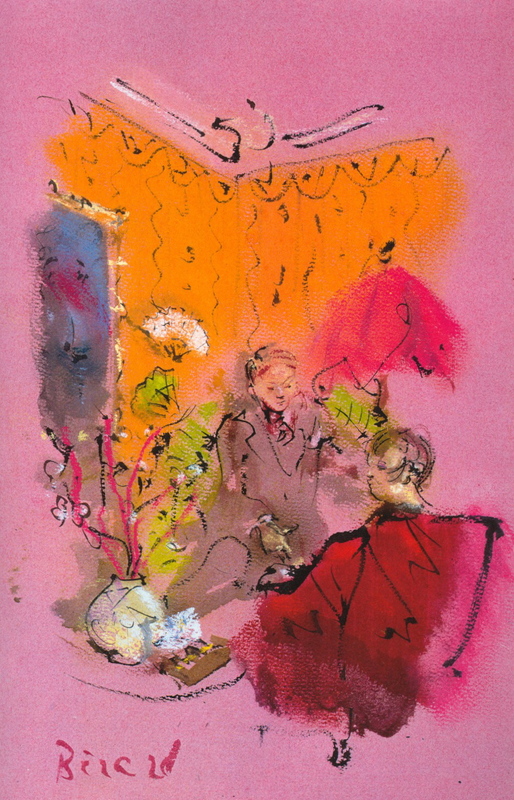 He was always creating—while dining with friends, like New York society hostess Elsa Maxwell, Bérard would constantly be drawing on table cloths, napkins, menus—caricatures, stage sets, costumes. The waiters would hover and often quickly whisk them away, usually to sell to collectors. 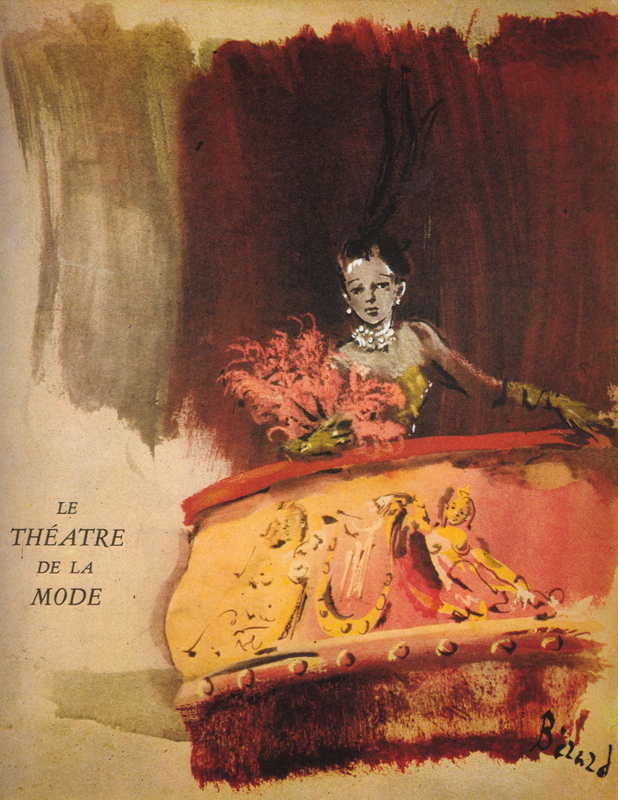 In 1930, Bérard designed his first theater set, for Jean Cocteau’s La Voix Humaine at the Comédie-Française. 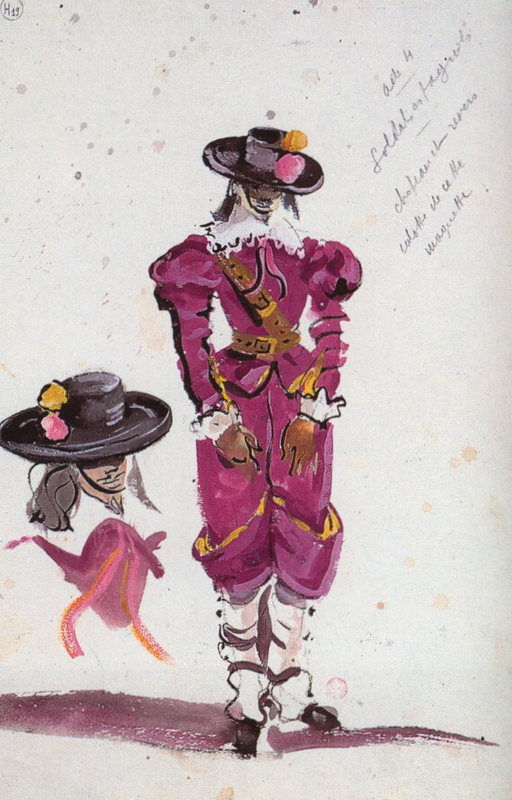 Cocteau was a life-long friend, and the work that Bérard is perhaps most famous for, is his set and costume design for Cocteau’s film masterpiece, La Belle et la Bête. 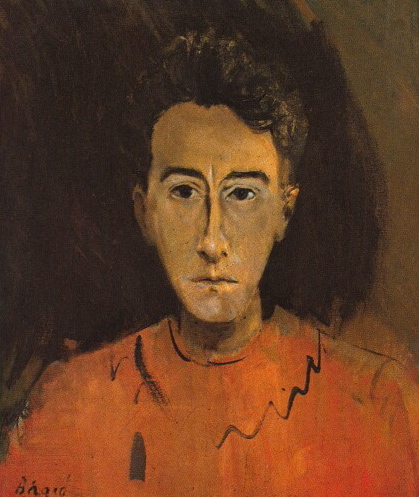 Unfortunately, Bérard also shared Cocteau’s vice, the smoking of opium, which lead to a life of drug addiction, repeated sanatorium cures, and contributed to his early death. In 1931, Bérard joined the company of the Ballet Russes in Monte Carlo, working with choreographer George Balanchine on the ballet Cotillon. Balanchine had taken over for ballet impresario and founder of the Ballet Russes, Sergei Diaghilev. Balanchine continued in Diaghilev’s tradition of scouring the garrets of Montparnasse and Montmartre to find unknown choreographers, set designers or musicians to collaborate with. 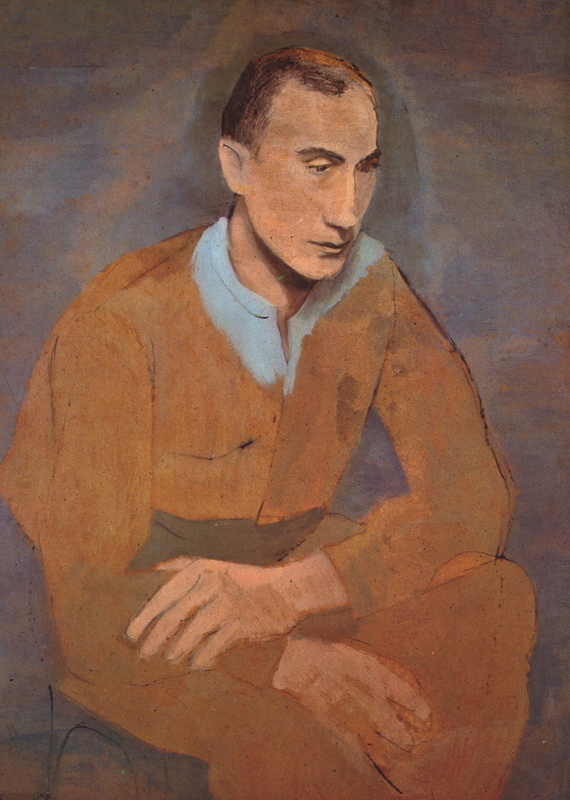 At first Balanchine declined to work with Bérard because he thought his work was already too well-known as an artist and illustrator, but the quality of Bérard’s work caused him to change his mind. Christian Bérard was my right hand. Since he was left-handed, I had a special, clever, gracious, light right hand: a magical hand. You may imagine the emptiness left by an artist who guessed all, and with the dilligence of an archeologist, conjured up naked beauty from the thin air where she resides. Bérard is dead, but that is no reason to stop following his instructions. I know what he would say about anything, in any circumstances. I listen to him and carry out his orders. Christian Bérard’s work is in the collections of the Museum of Modern Art, New York; The Menil Collection, Houston and the McNay Art Museum in San Antonio, Texas. 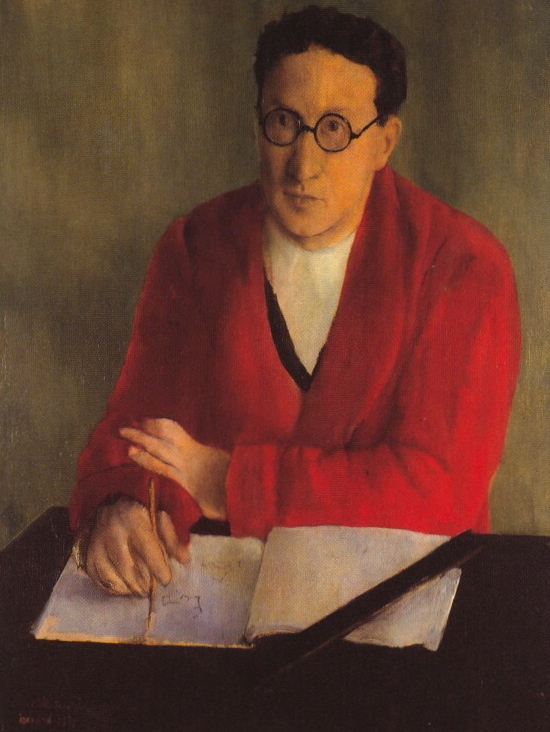 Christian Bérard, by Boris Kochno, with an introduction by John Russell. Thames and Hudson, 1988.